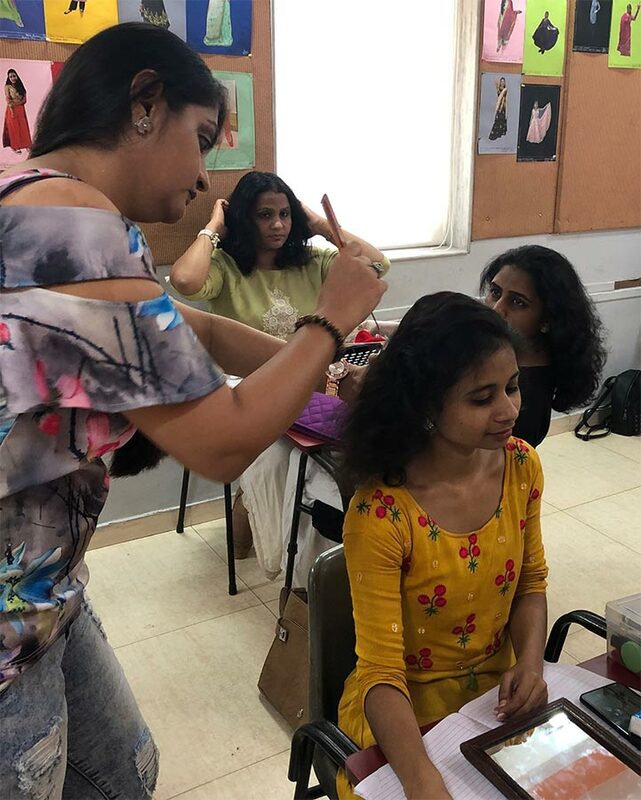 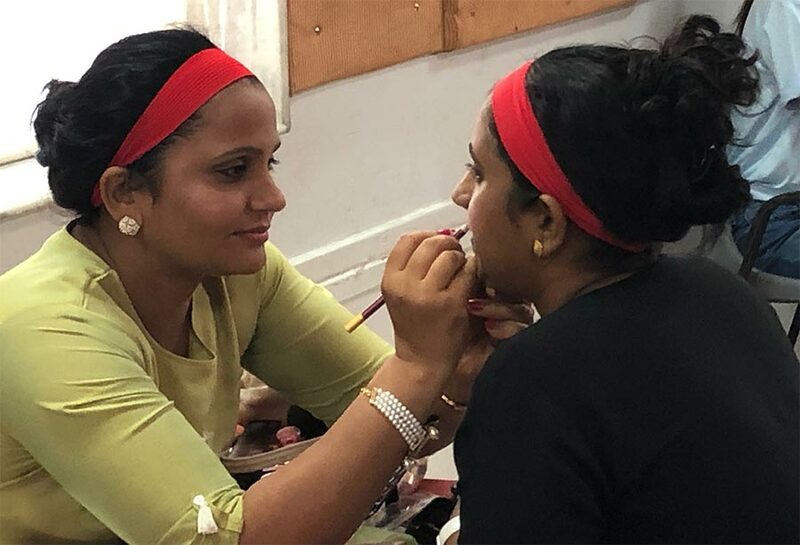 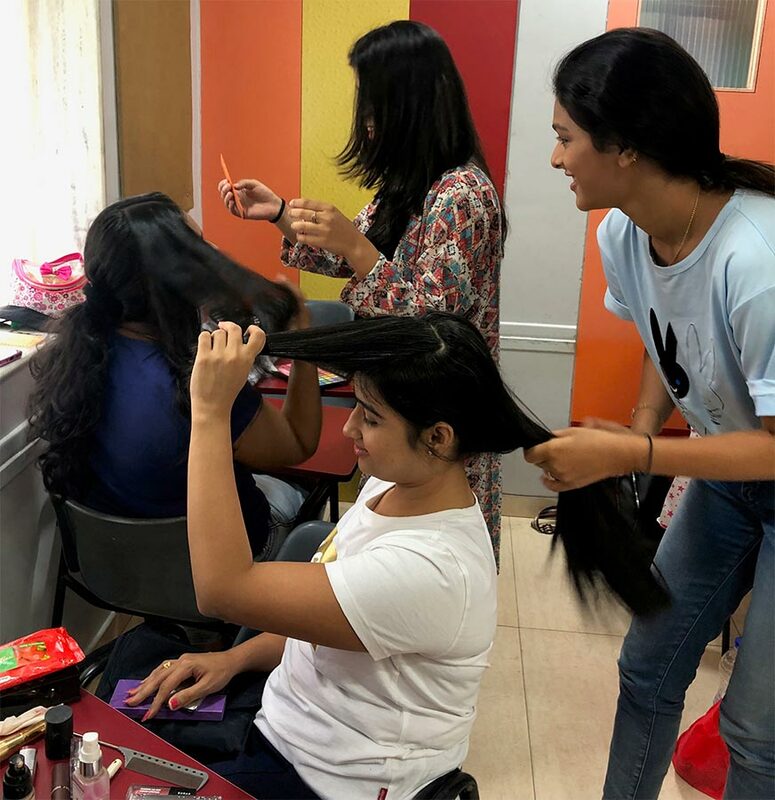 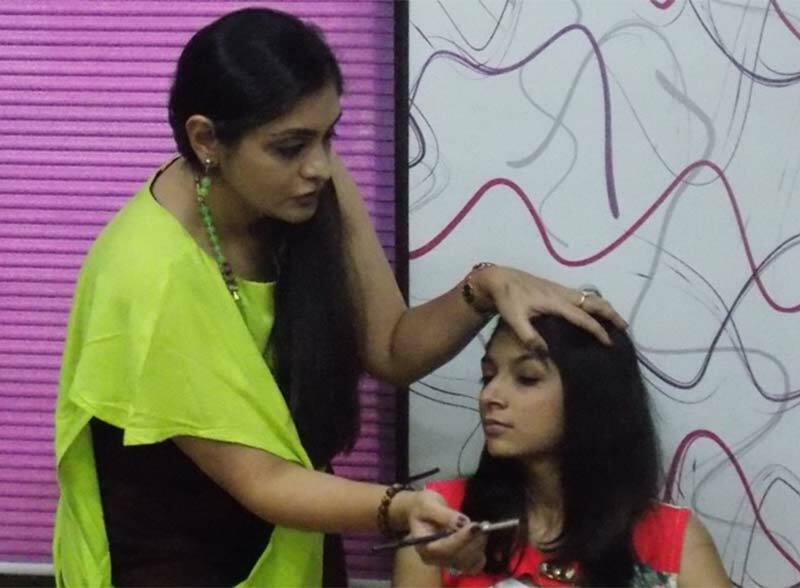 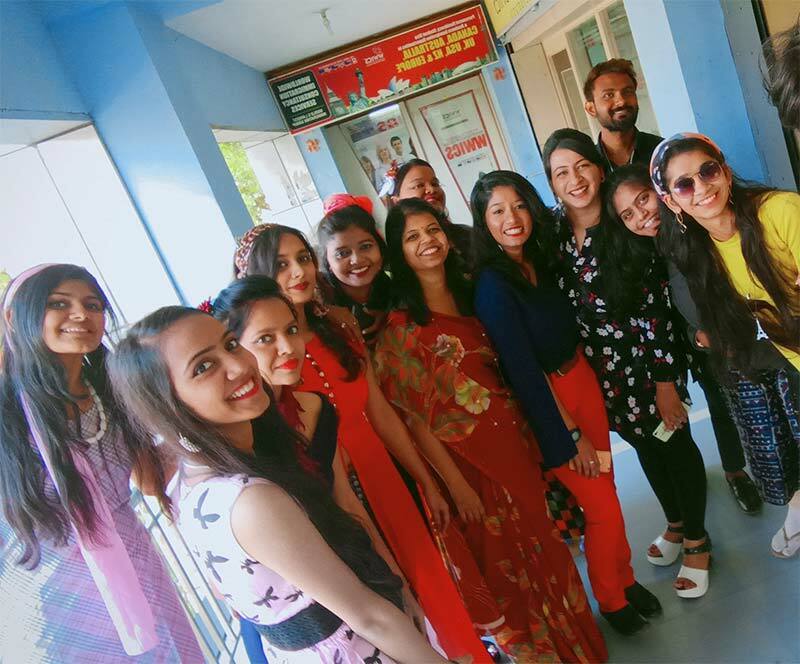 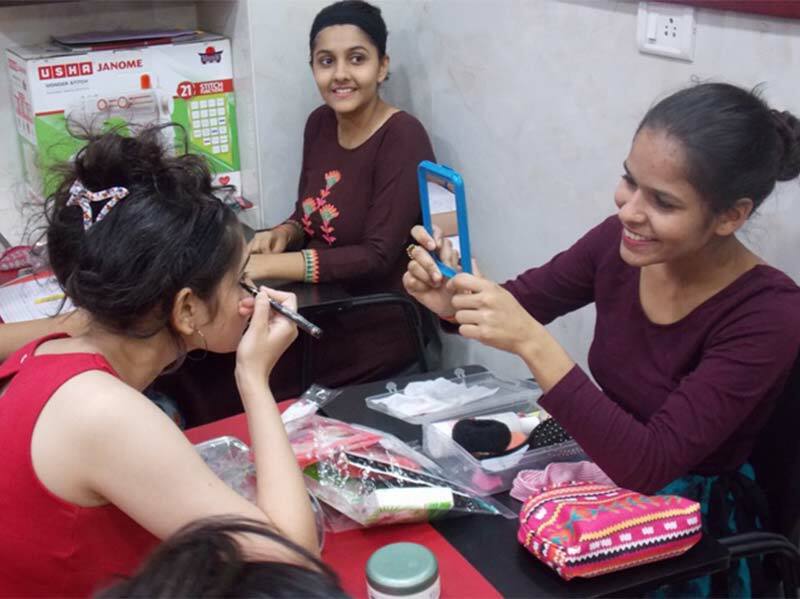 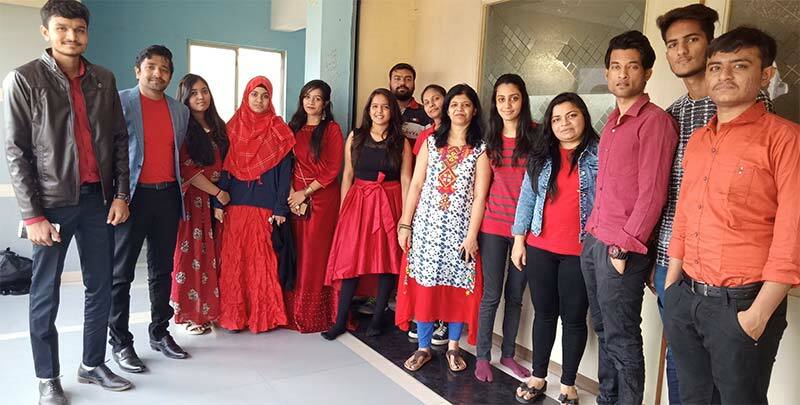 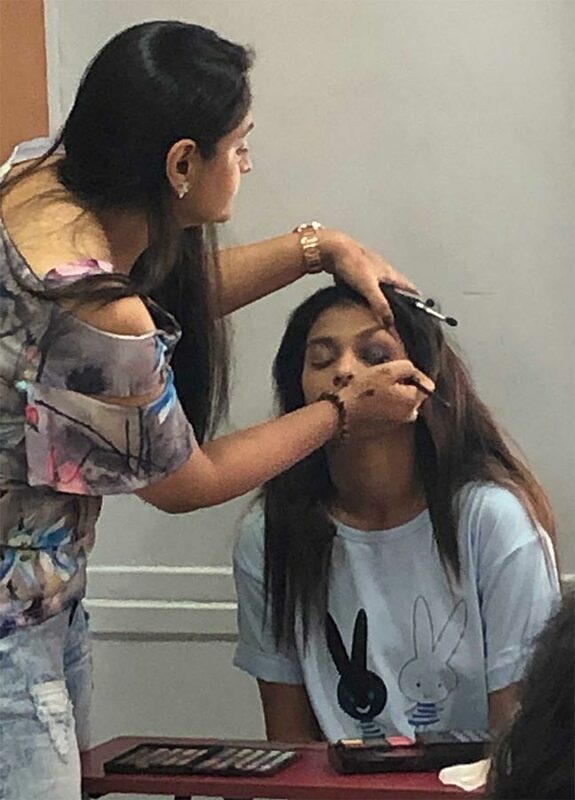 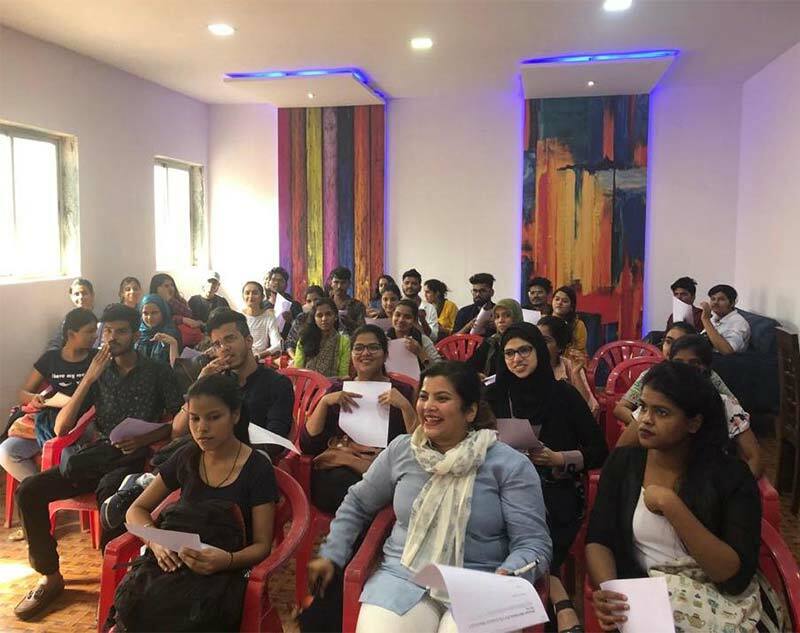 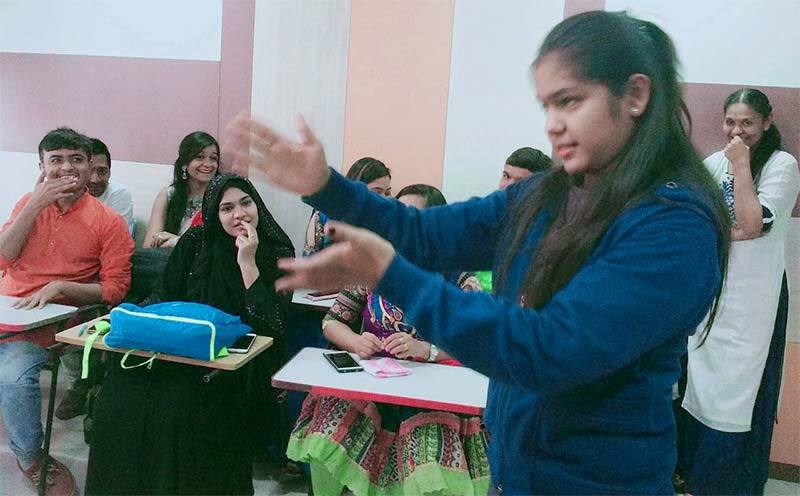 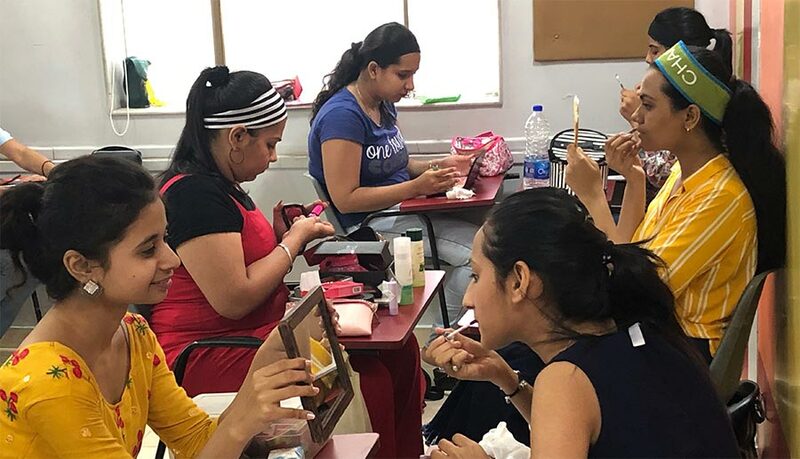 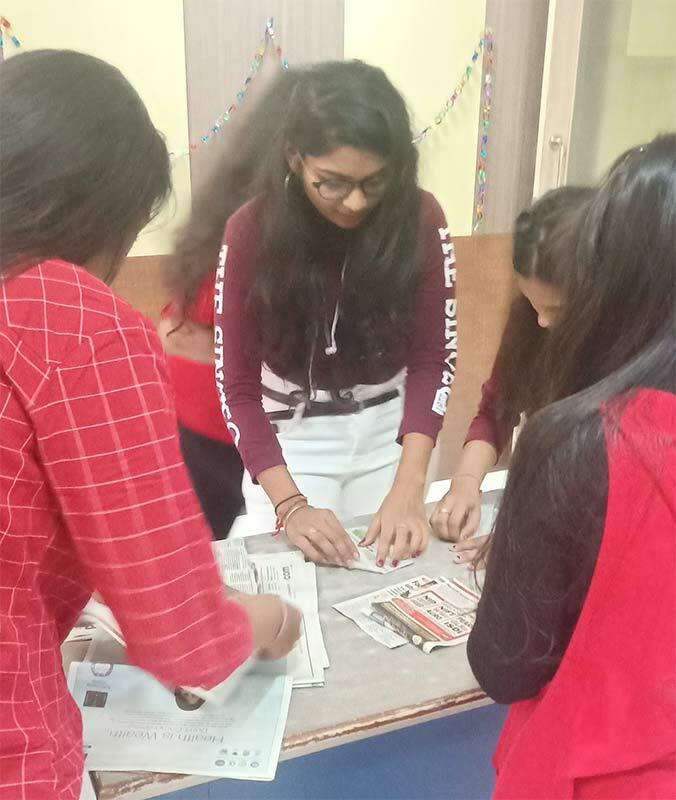 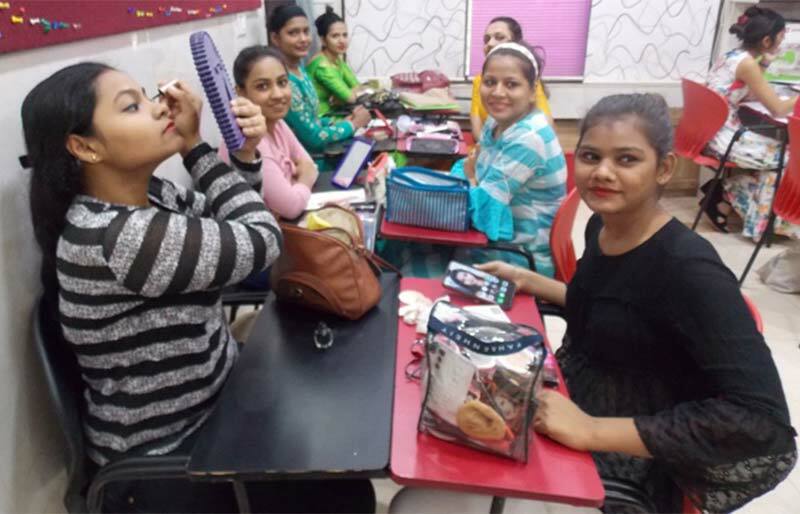 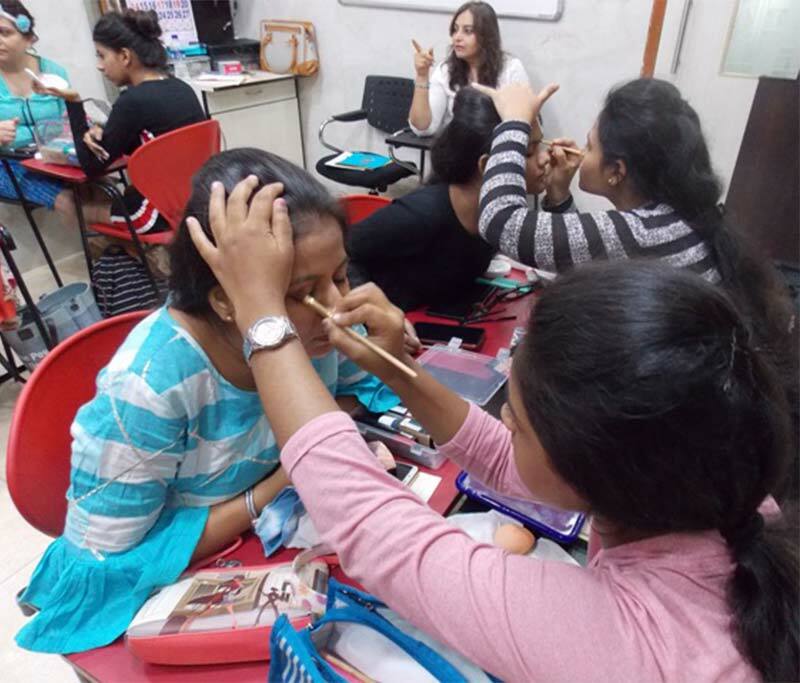 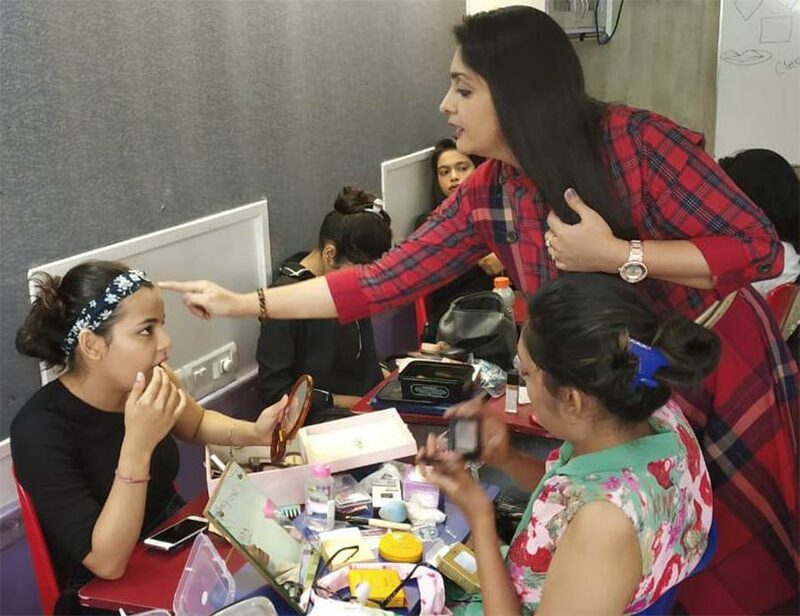 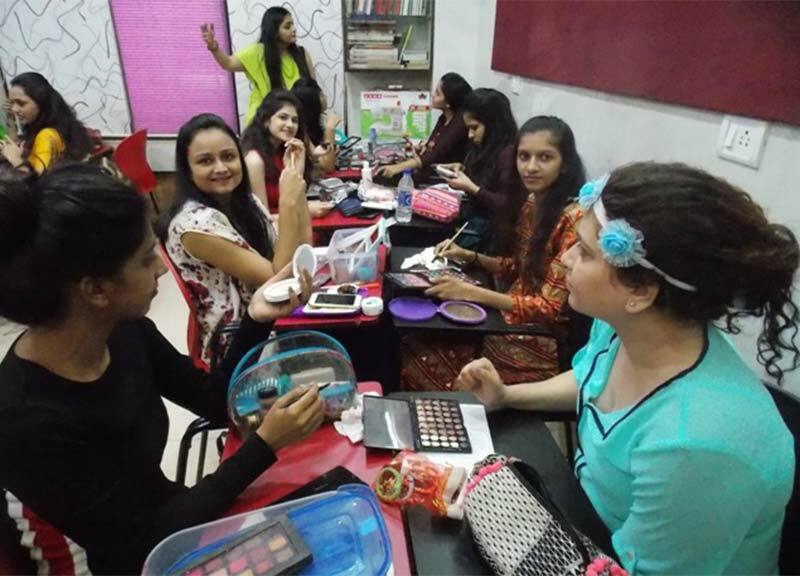 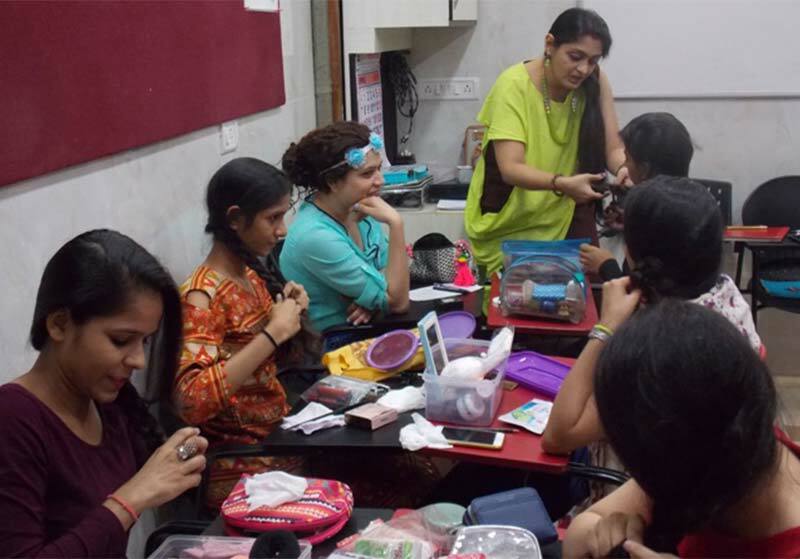 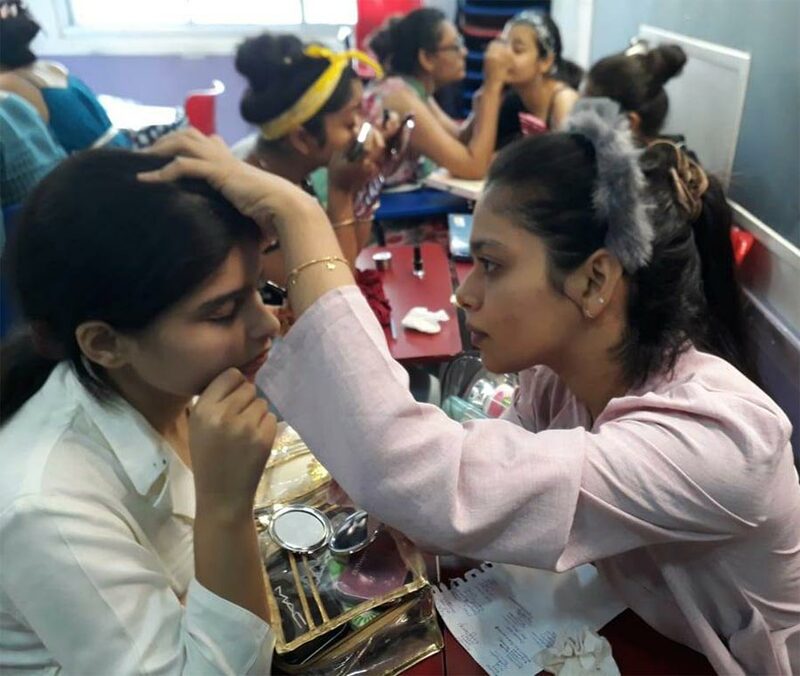 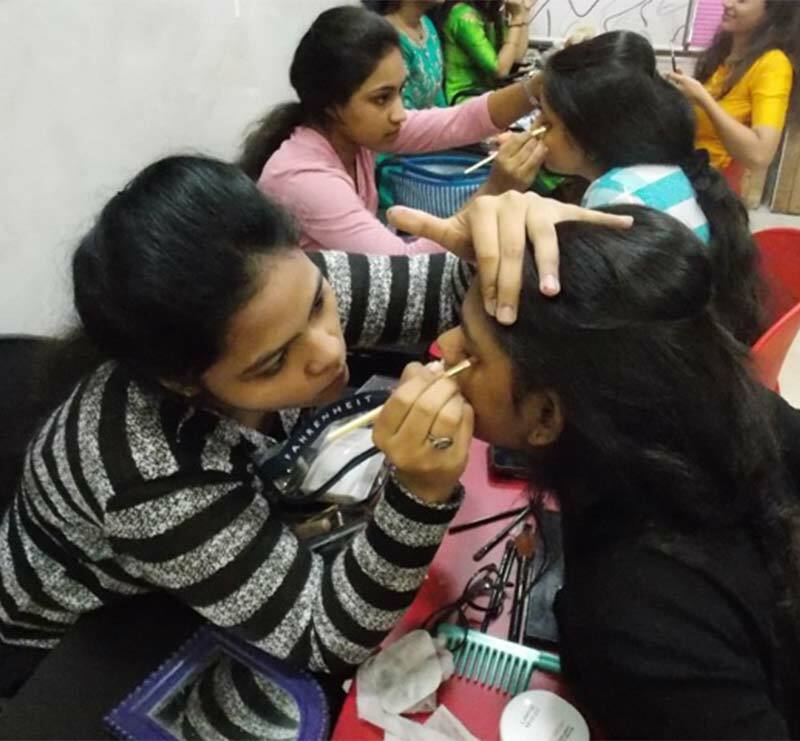 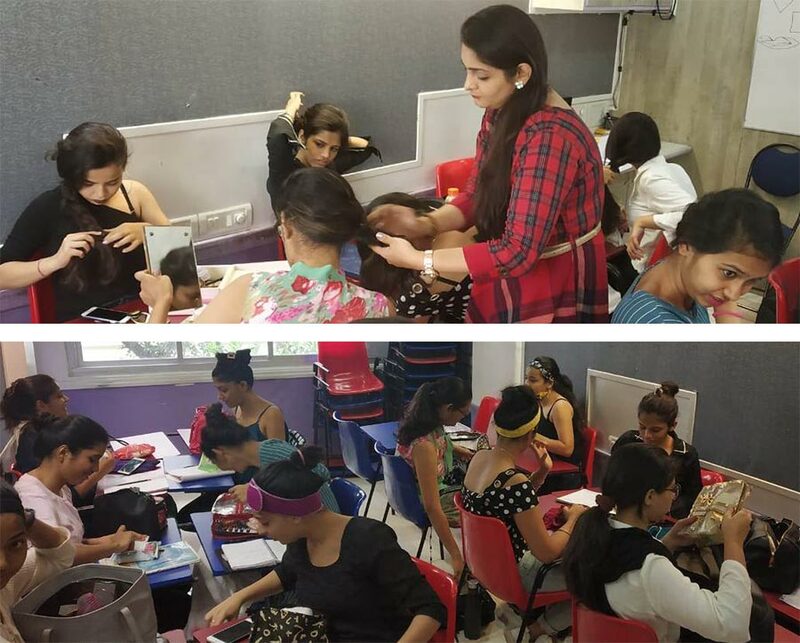 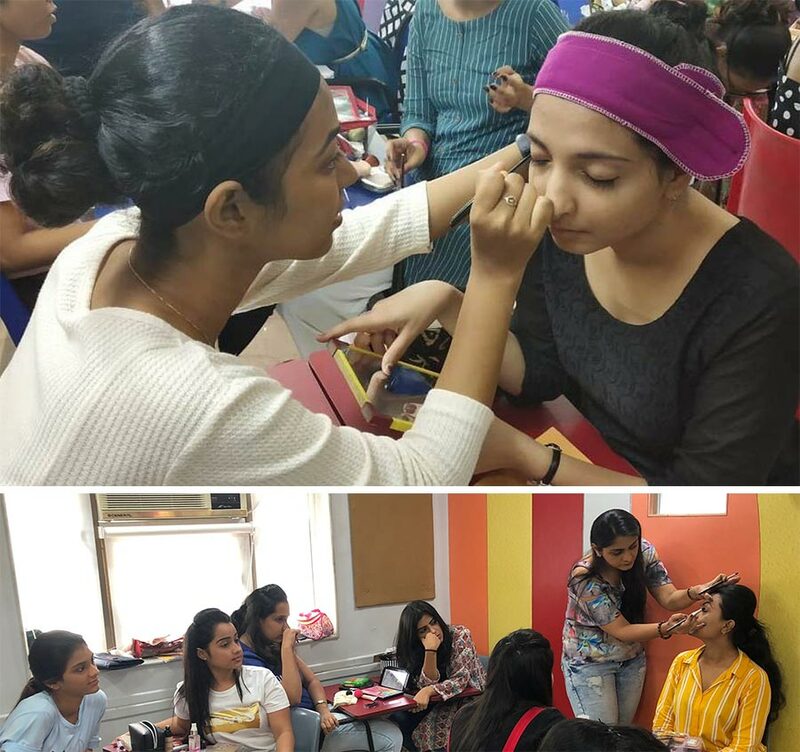 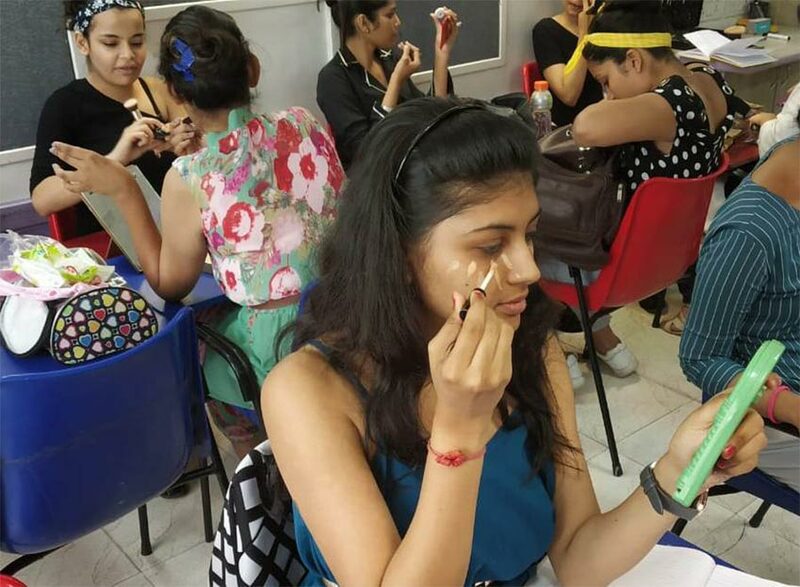 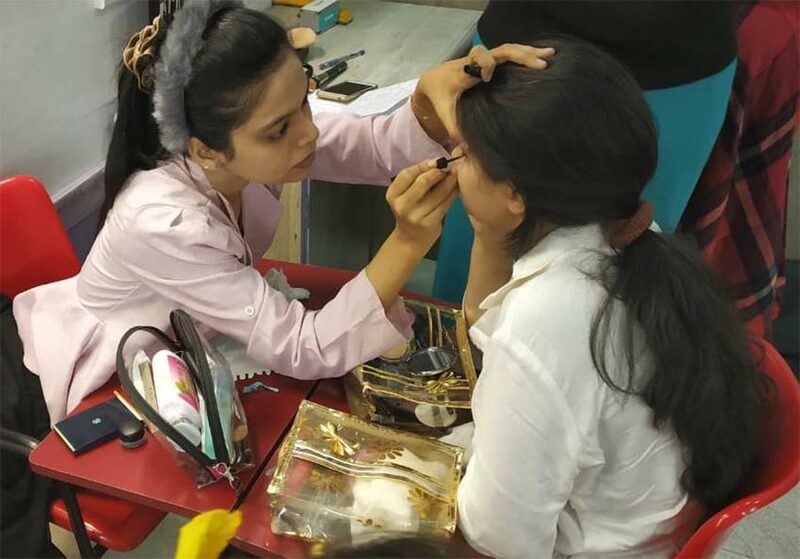 After a successful session for Ghatkopar,Mumbai, one more Make over & Stylizing session conducted by make up artist Ms. Charmi Doshi for IITC Fashion Designing students of Churchgate,Mumbai and Thane as part of their course curriculum. 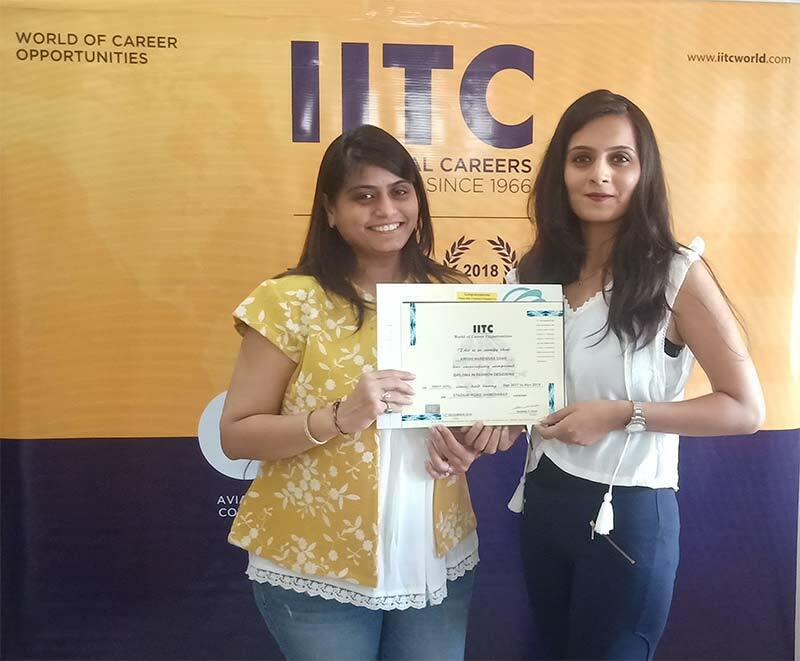 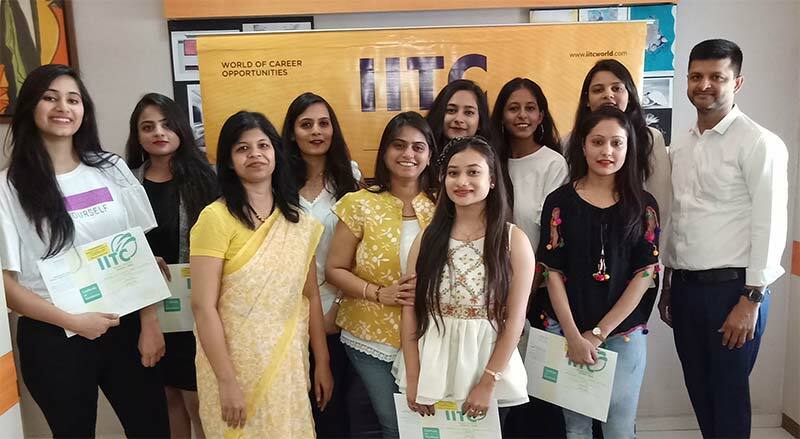 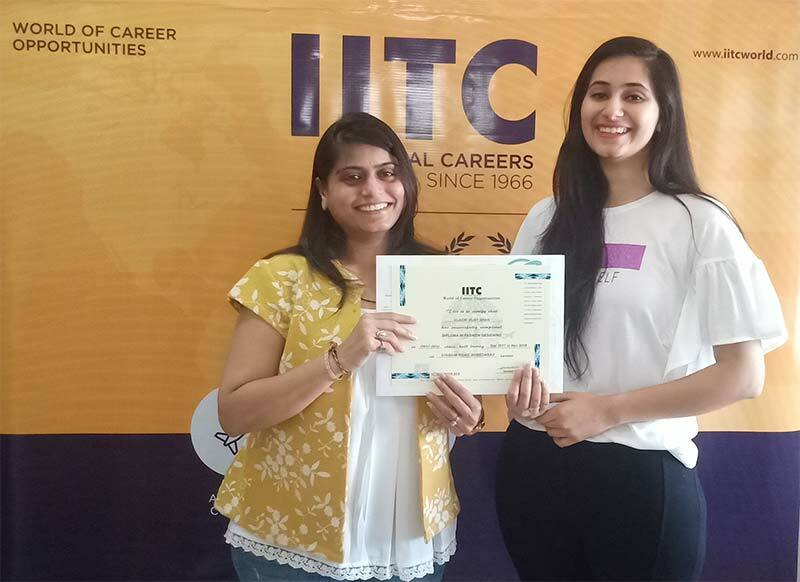 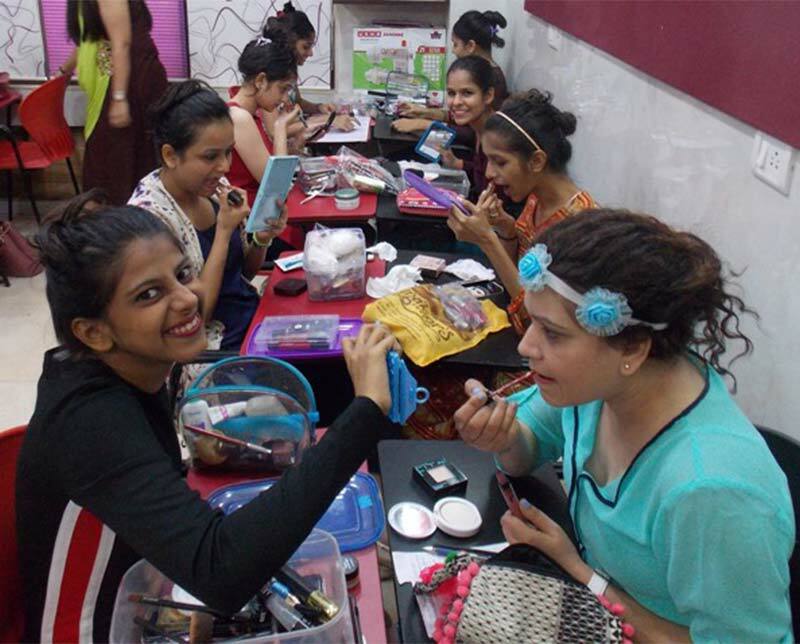 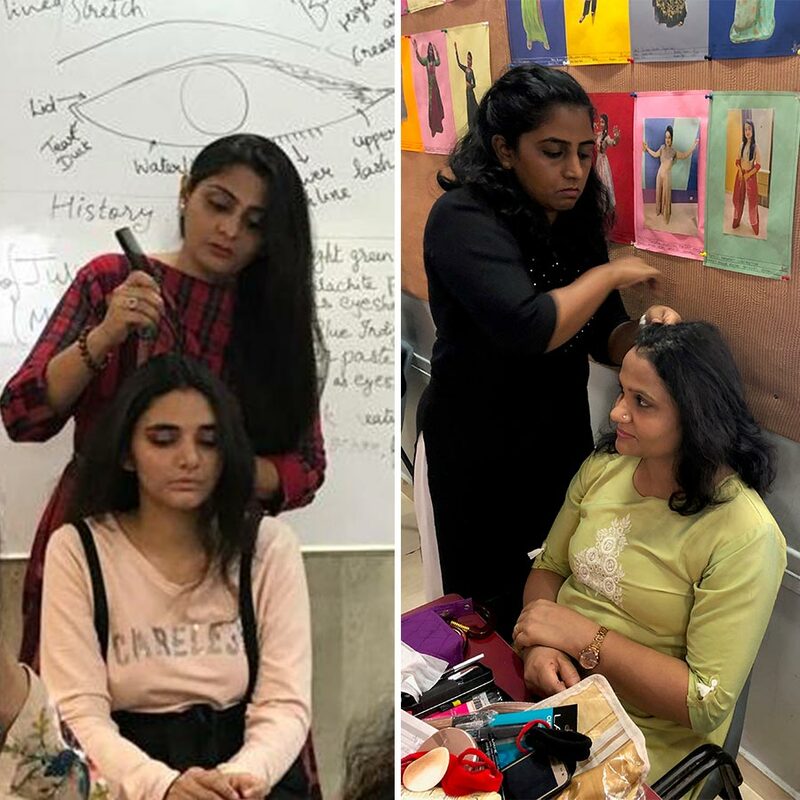 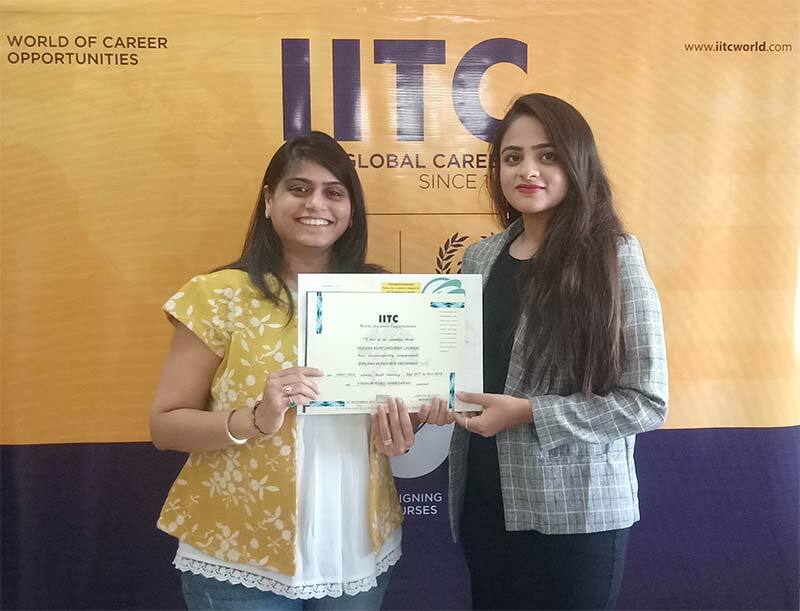 Make over & Stylising session organised by IITC & conducted by a professional make up artist Ms. Charmi Doshi for IITC Fashion Designing students as a part of their course curriculum. 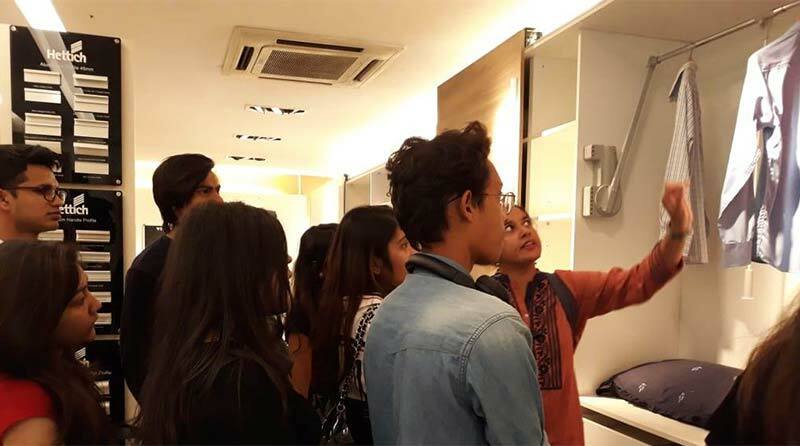 Industrial Visit to Jiyo Junoon by Fashion and Interior Designing Students of IITC. 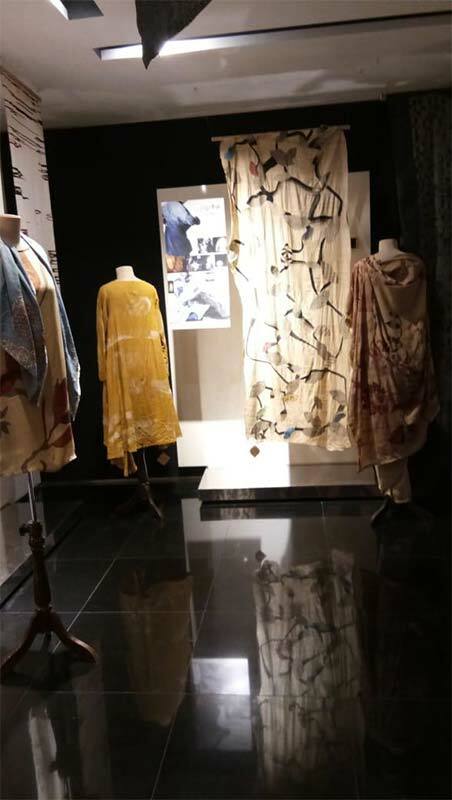 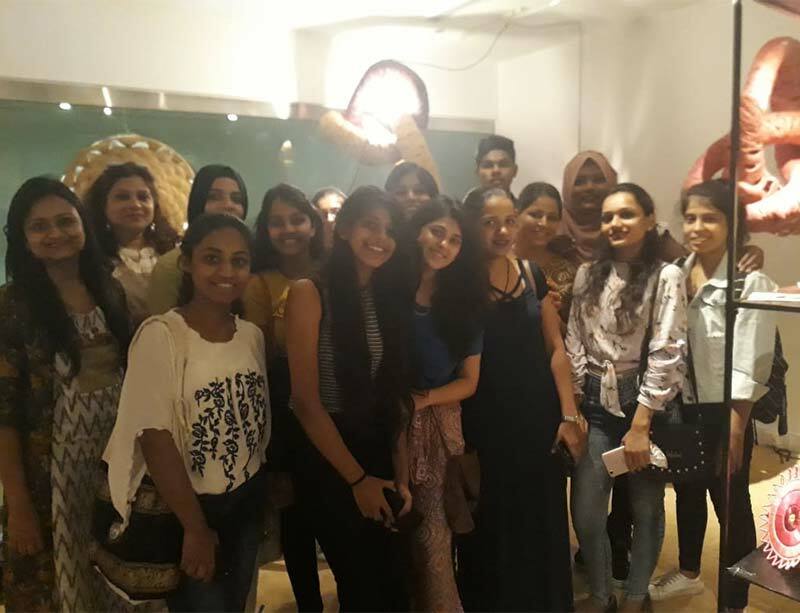 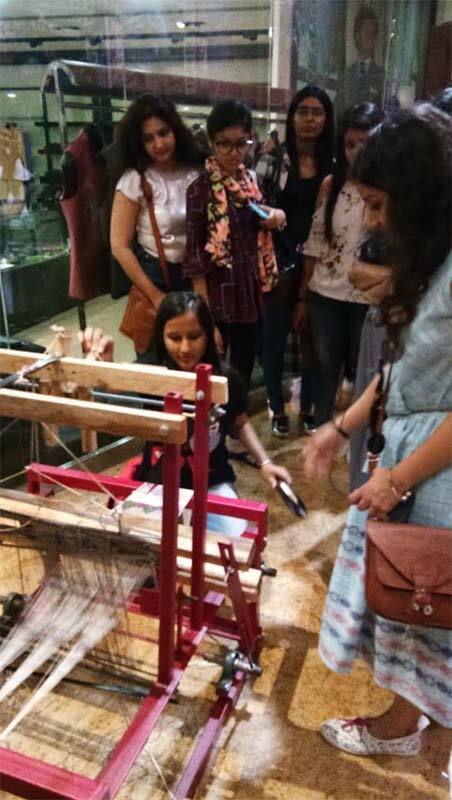 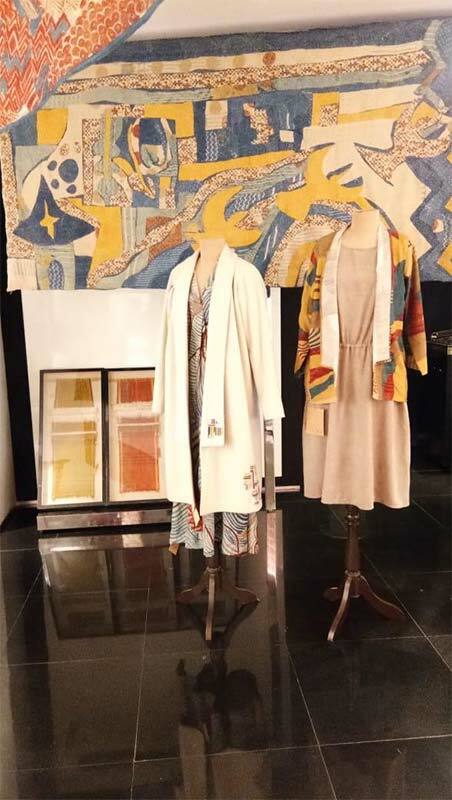 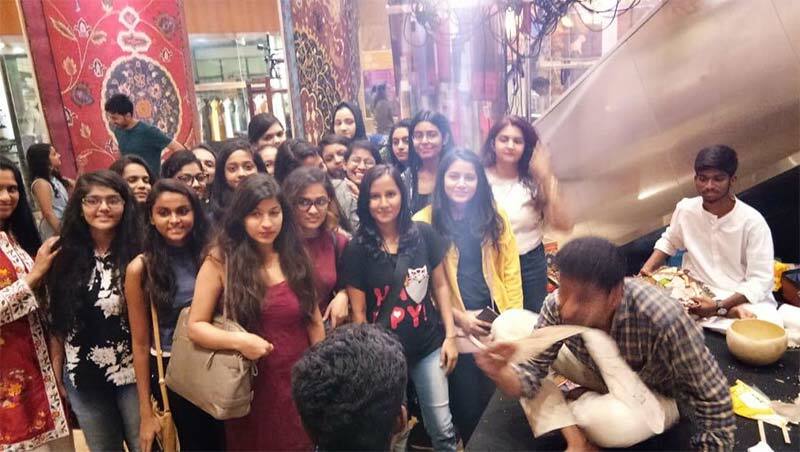 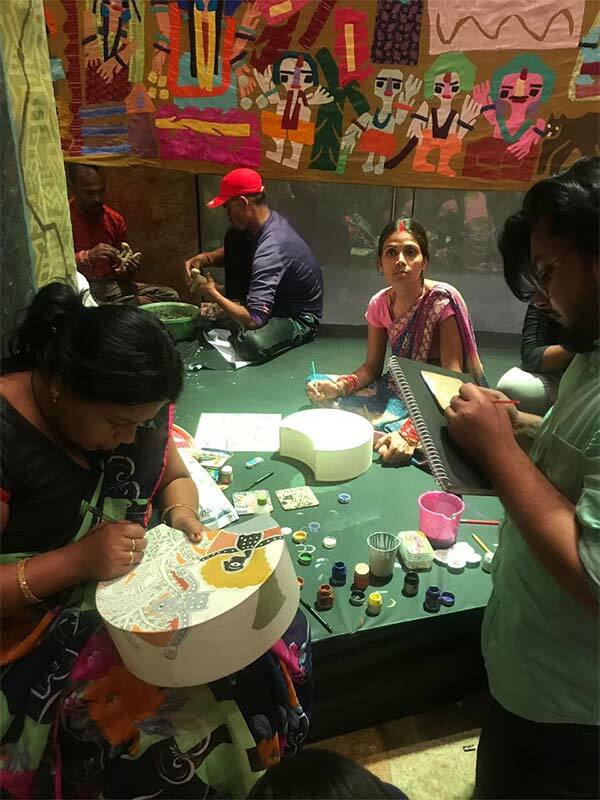 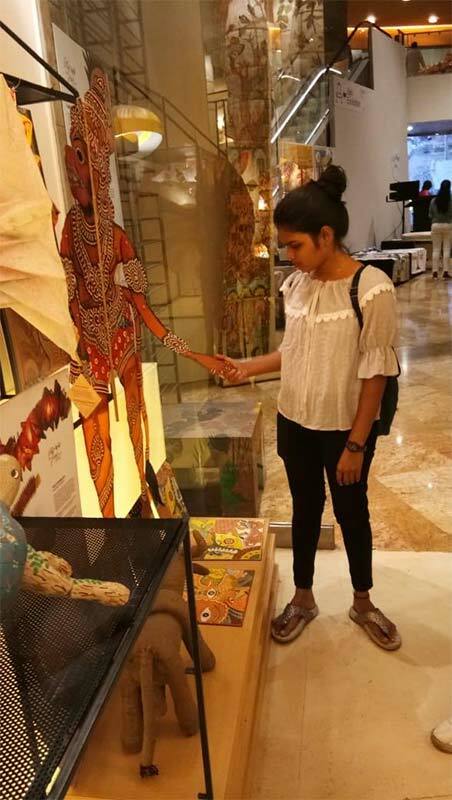 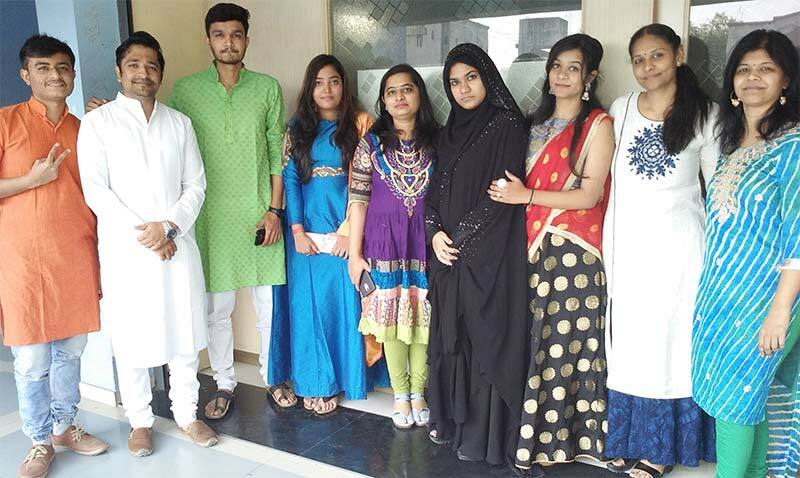 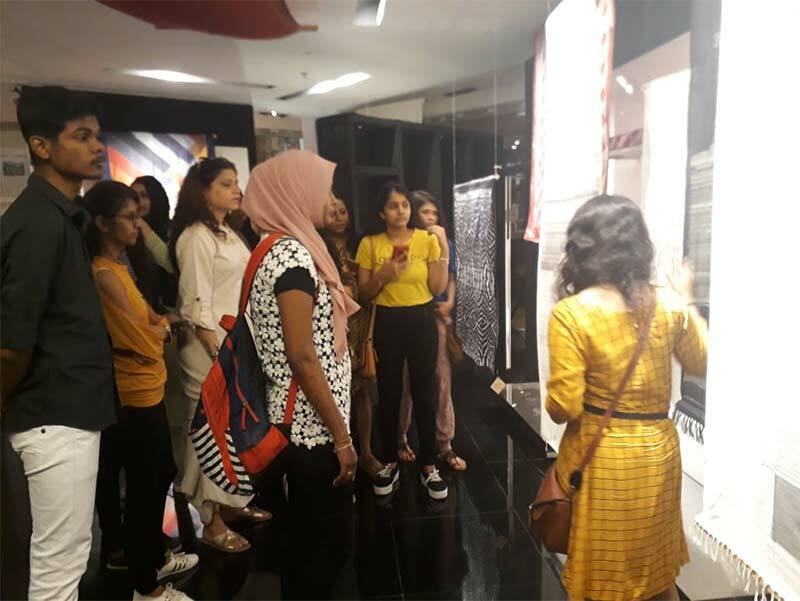 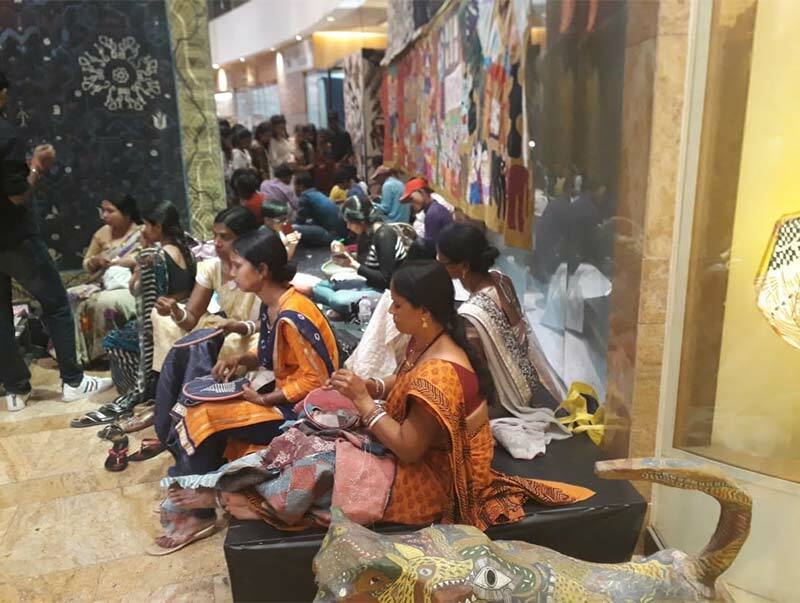 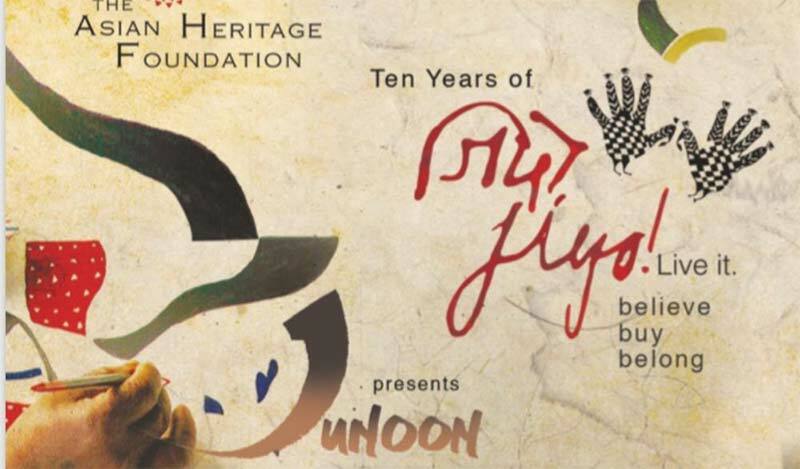 IITC Mumbai Fashion Designing & Interior Designing students visited Junoon, hosted by Jiyo, an array of individualistic designs at Grand Hyatt, Mumbai. 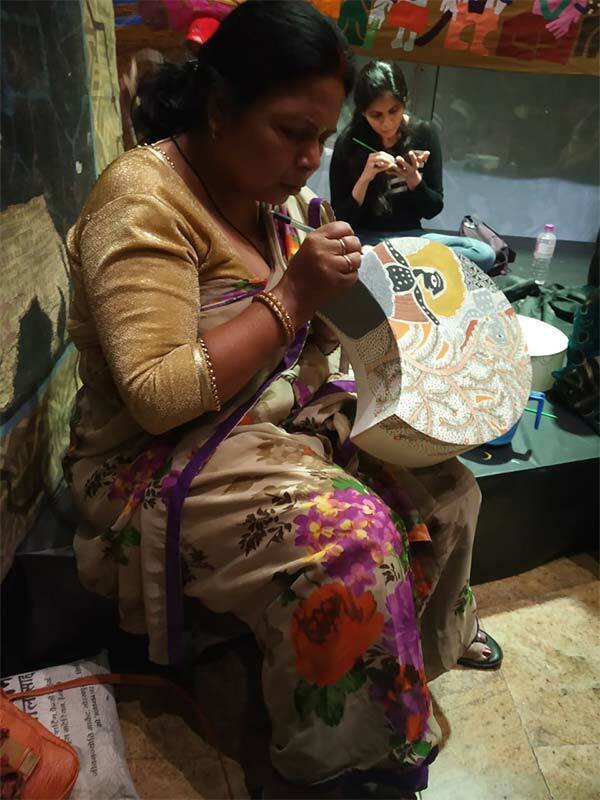 Coming to the city for the first time was the largest bazaar for handmade products, featuring deeply rooted traditional age old art form designs fused with contemporary innovations. 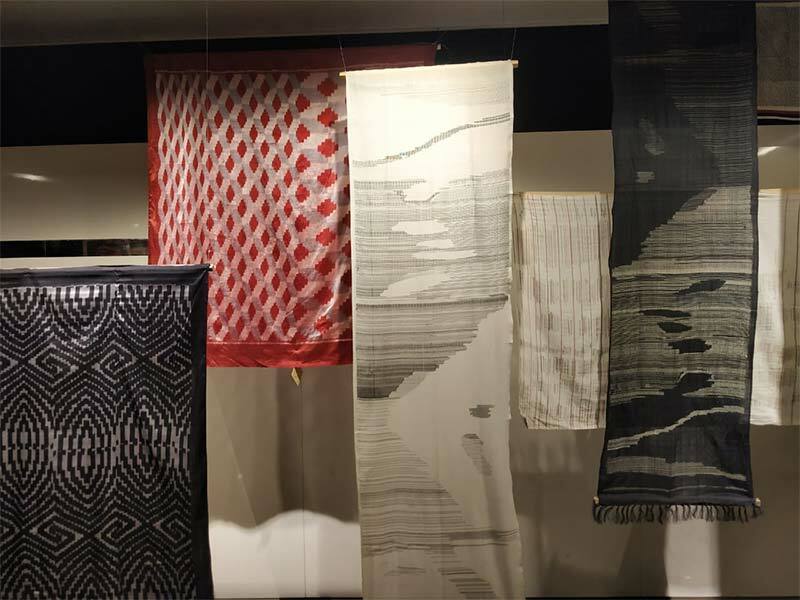 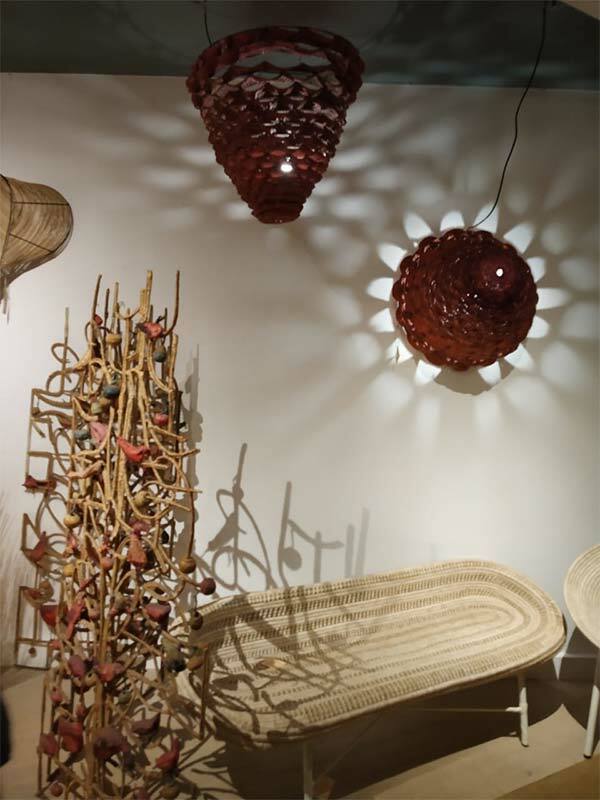 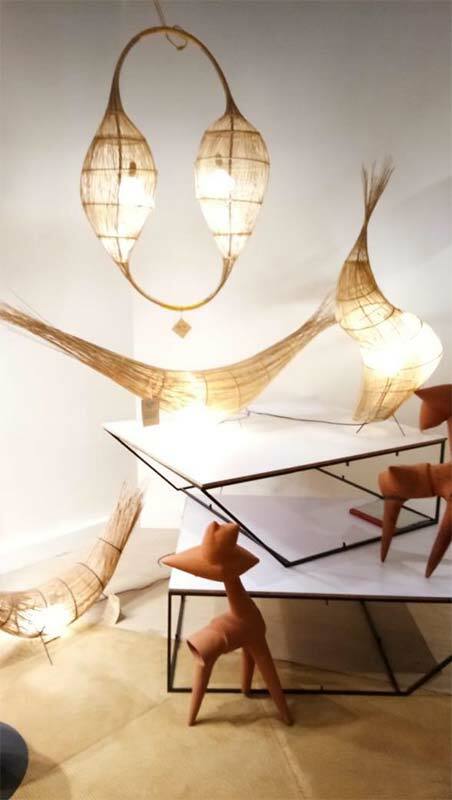 From grass furniture to leather lamps, modular wall ties to tribal papier mache, silk ikats to cotton brocades. 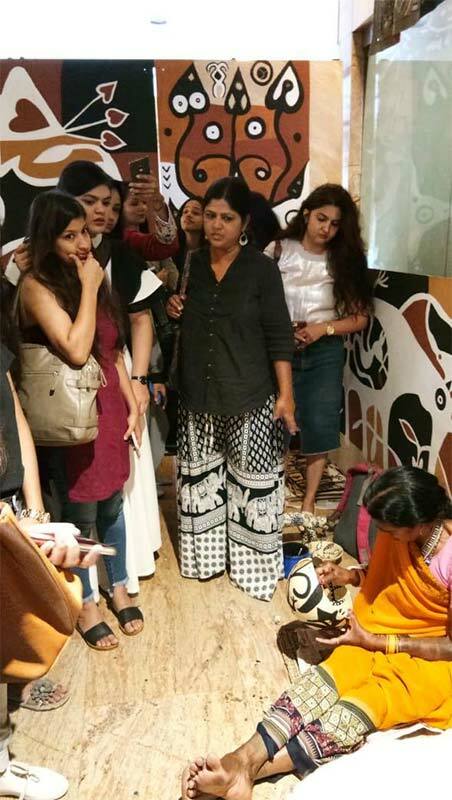 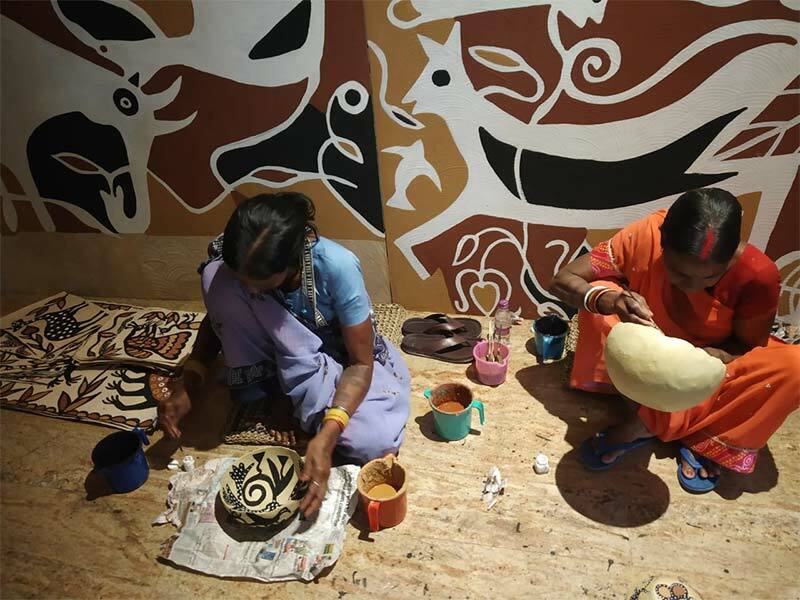 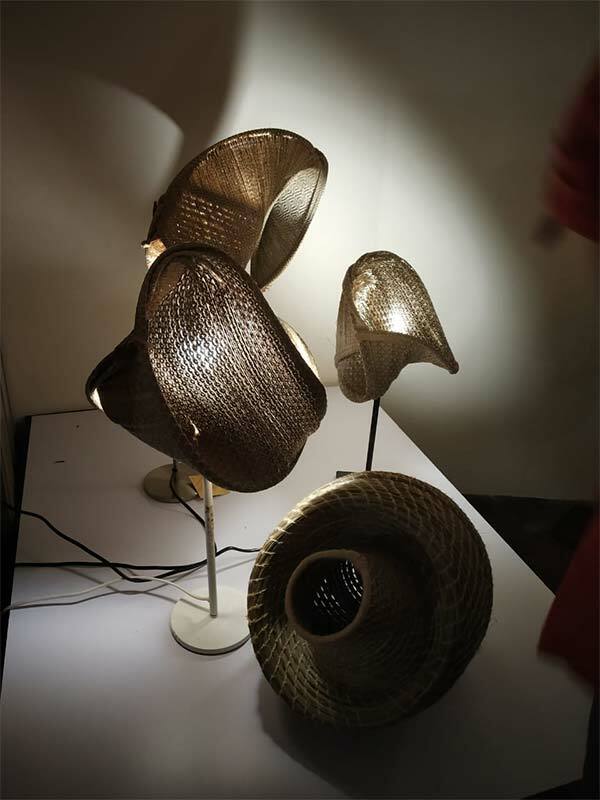 Artisans from six states displayed products that were aesthetically manufactured, items from the world of slow fashion, forest foods and bespoke designs that are created and owned by the self-empowered communities of India’s red corridor — Madhya Pradesh, Bihar, Jharkhand, Odisha, Telangana and Andhra Pradesh. 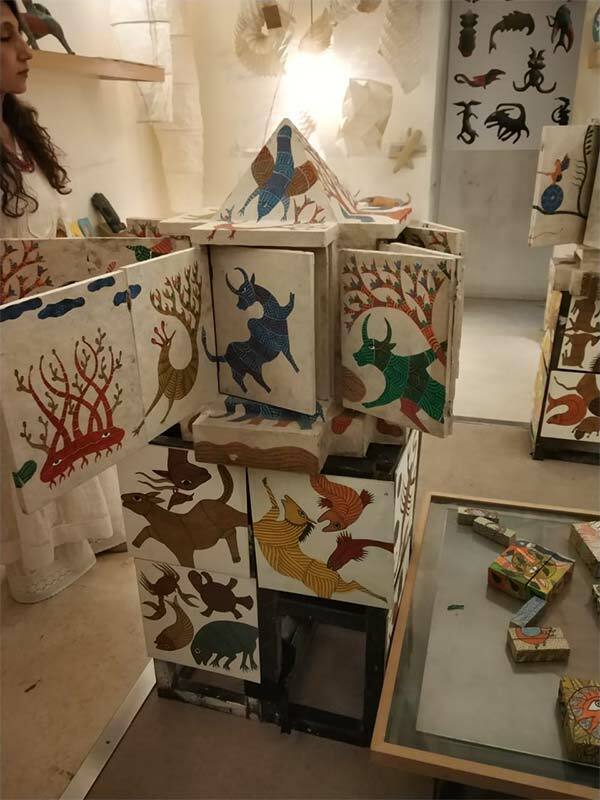 An array of individualistic and vibrant designs such as earth totems as incense burners, silk ikats, nature accessories, design-oriented modular wall tiles, cotton brocades, grass furniture, tribal papier mache, asymmetric needle-work, leather lamps, forest food products and much more! 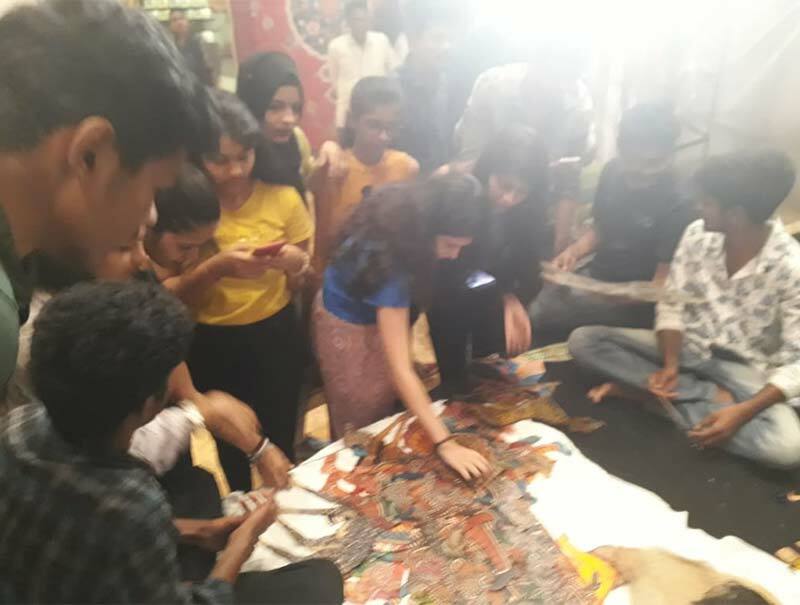 Essentially, it was much more than a marketplace - it was an exuberant confluence of conversations, performances and experiential exhibits. 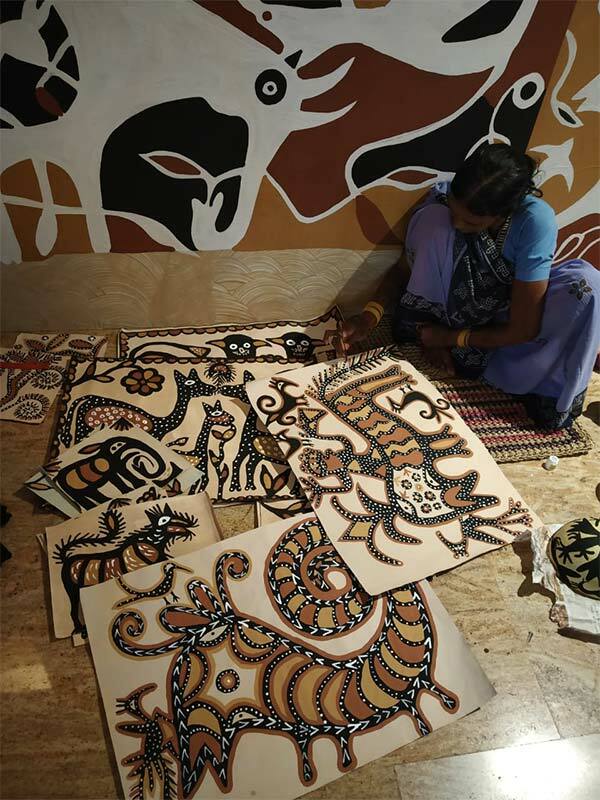 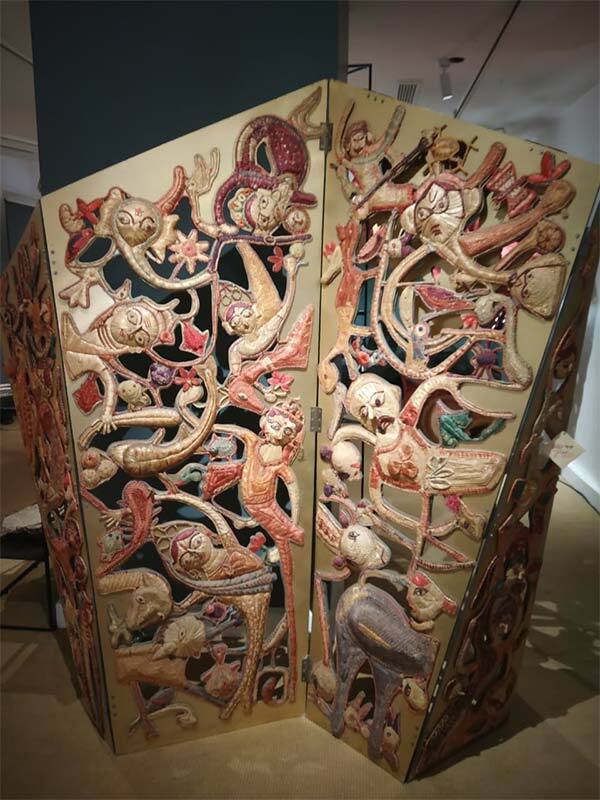 From inherited traditions, handmade-machine made, local to global, the magic of making-doing-being and everything in between, it upholds every aesthetic and craft. 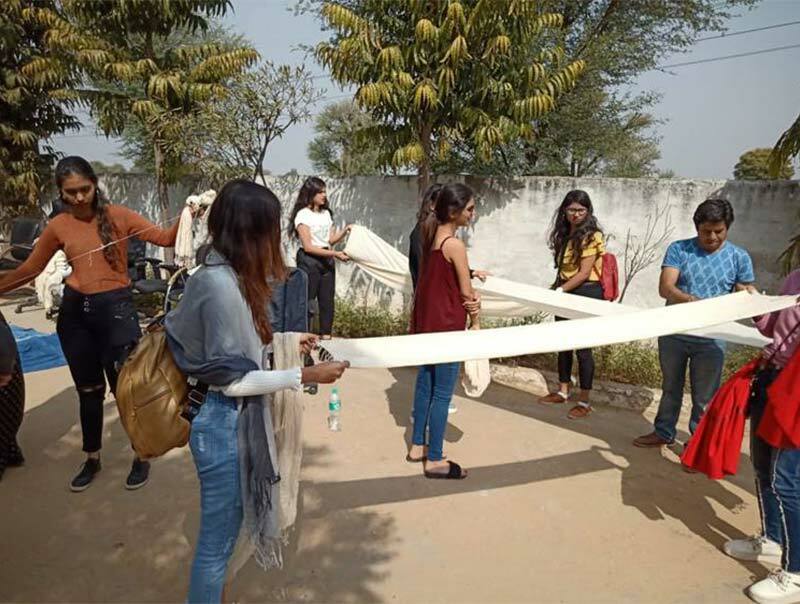 IITCians felt this was indeed a festival that celebrates what Village India can Make and Do for the world. 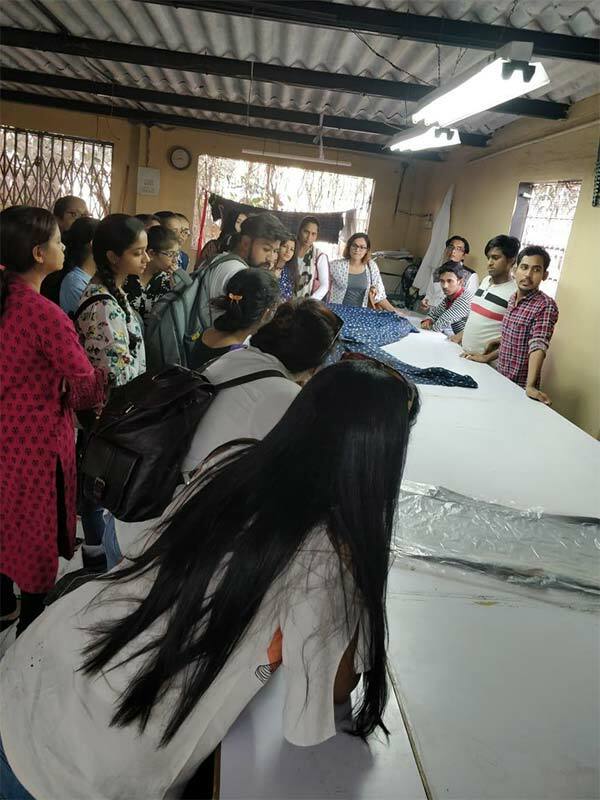 Industrial Visit by Fashion Designing Students of IITC, Mumbai. 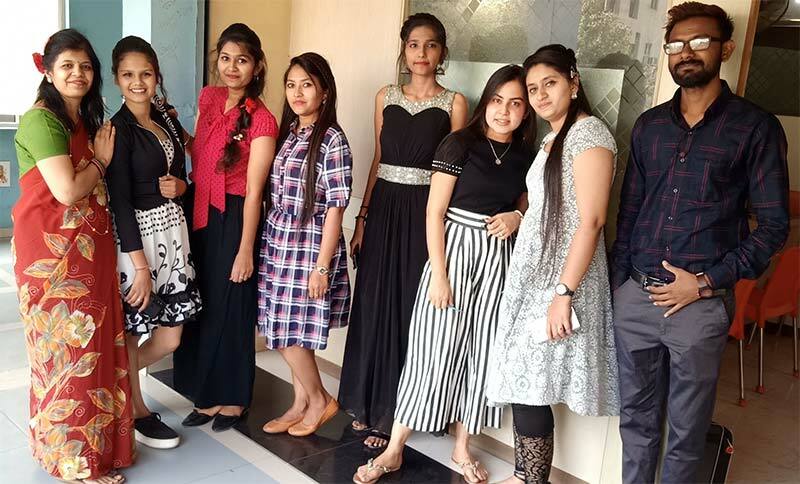 IITC has been innovative & competitive in updating its Fashion Designing Course since last 3 decades. 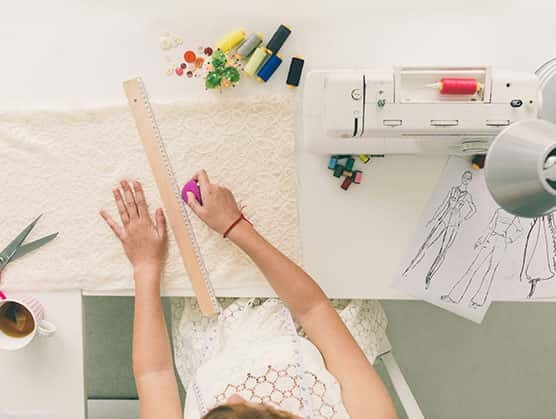 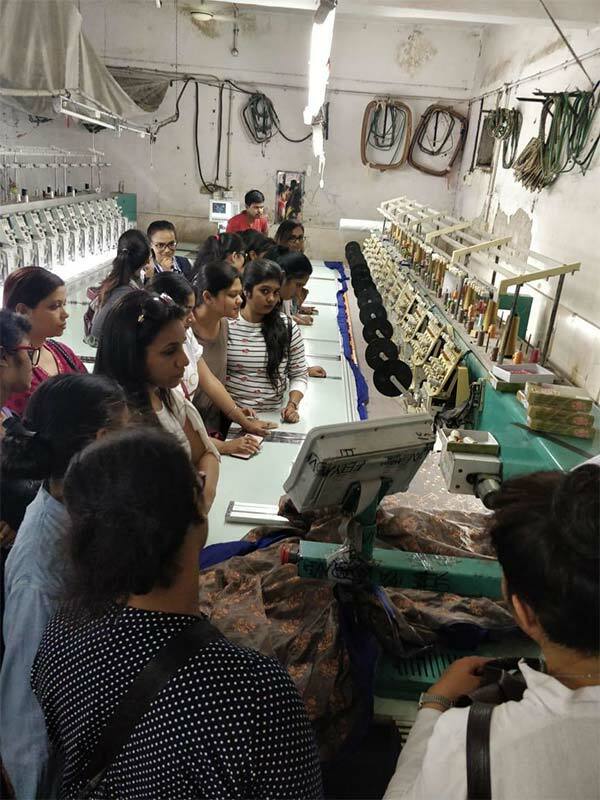 The new course curriculum in addition to regular Fashion Designing topics includes Industrial visits, Garment exports, Fashion Accessory Designing, Textile Designing and host of other topics that enables a Fashion Designing student to have an edge in the competitive industry. 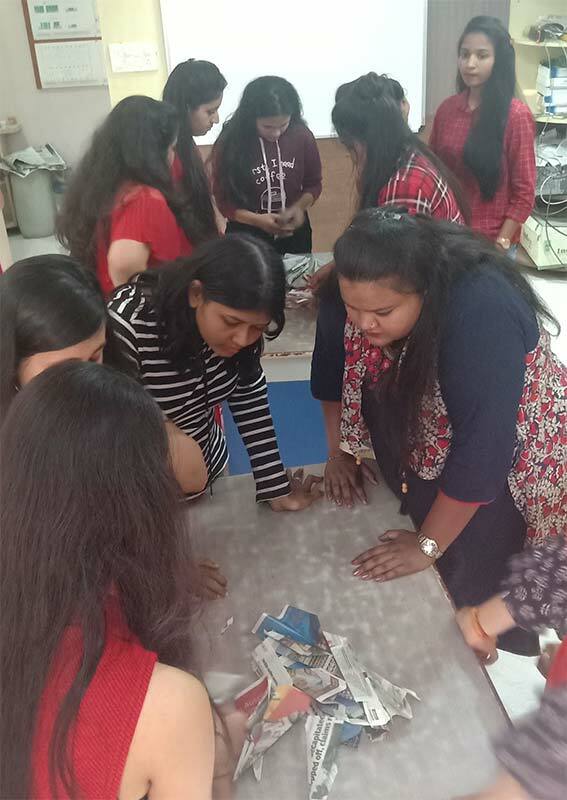 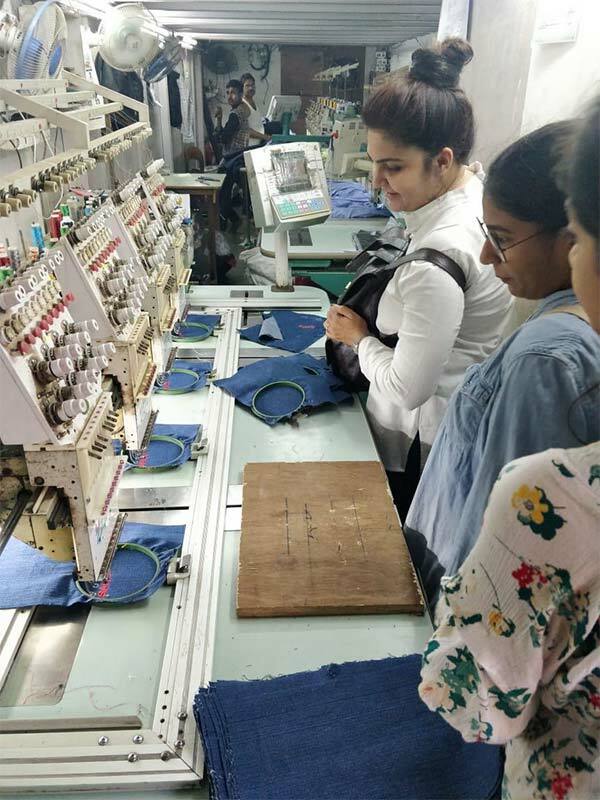 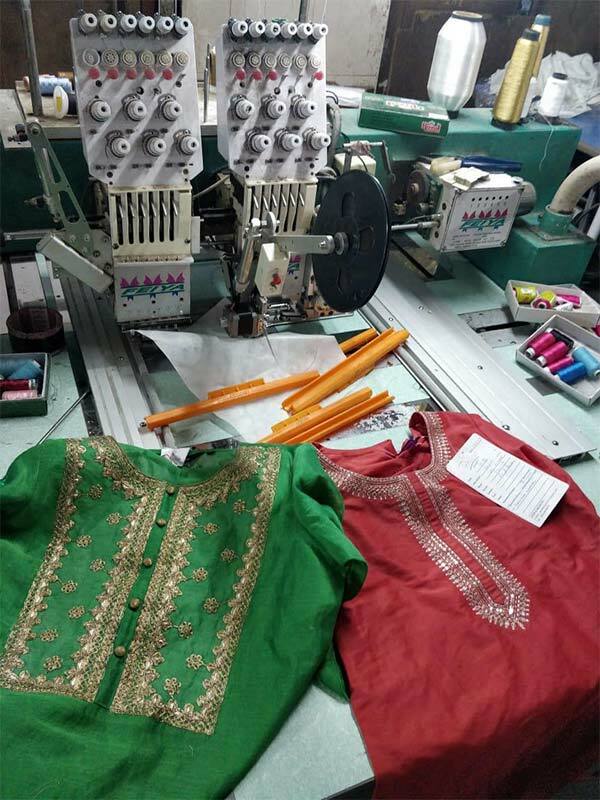 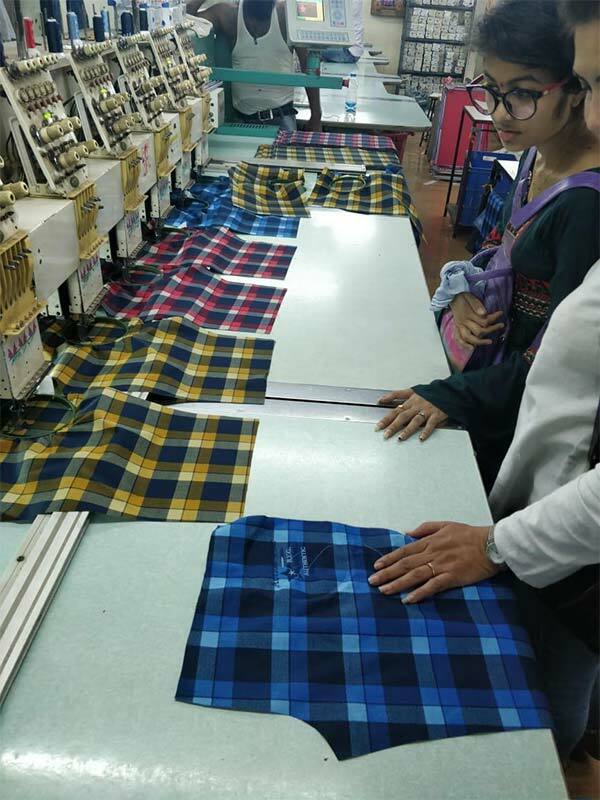 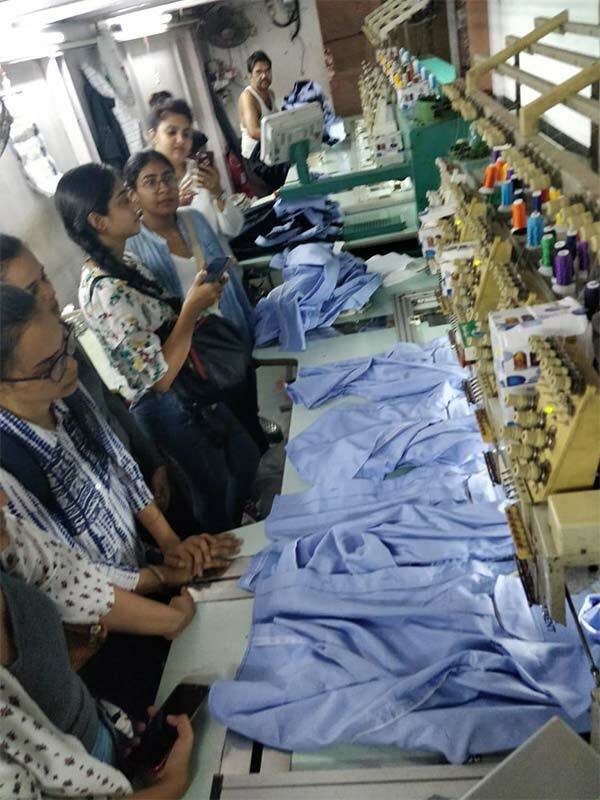 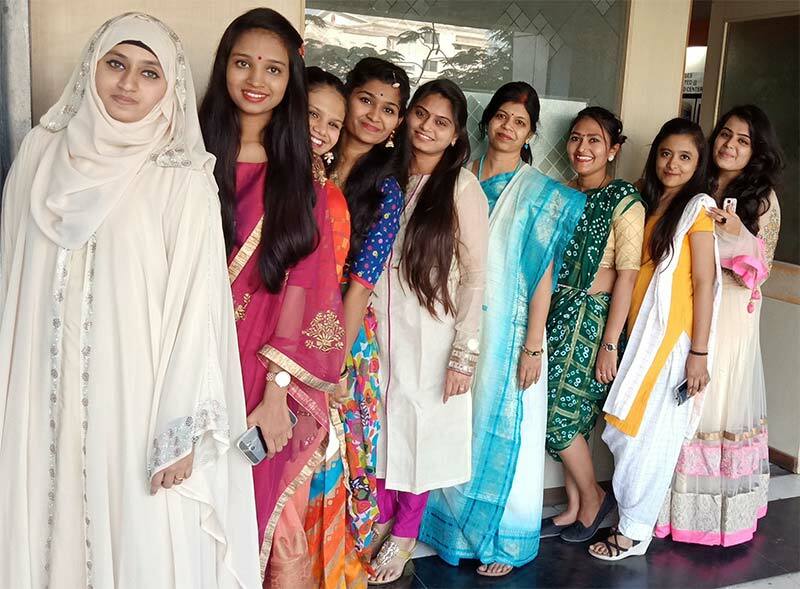 Recently one more batch of Fashion designing students from IITC visited a Mens Shirt unit, Ladies Kurti manufacturing and Machine embroidery unit as a part of Industrial visit training. 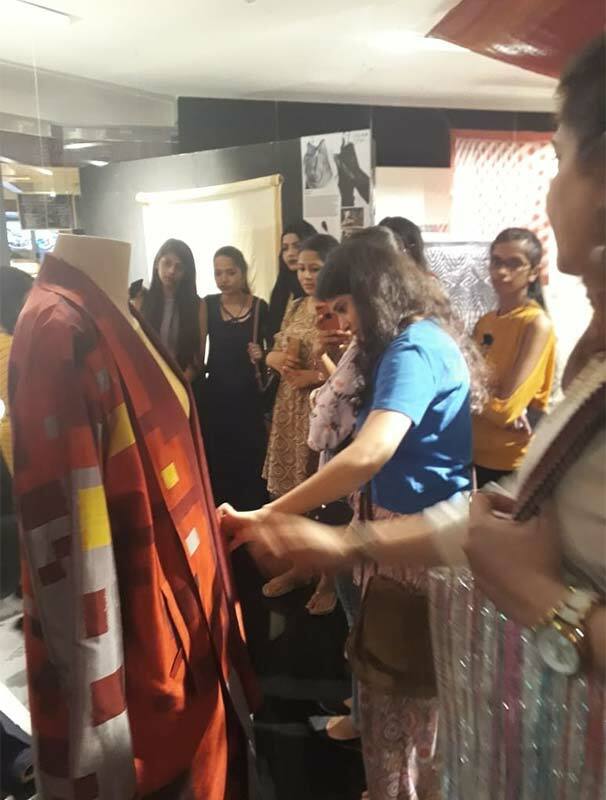 The students learnt the different stages of a garment right from a design on paper (illustration) to production and packaging. 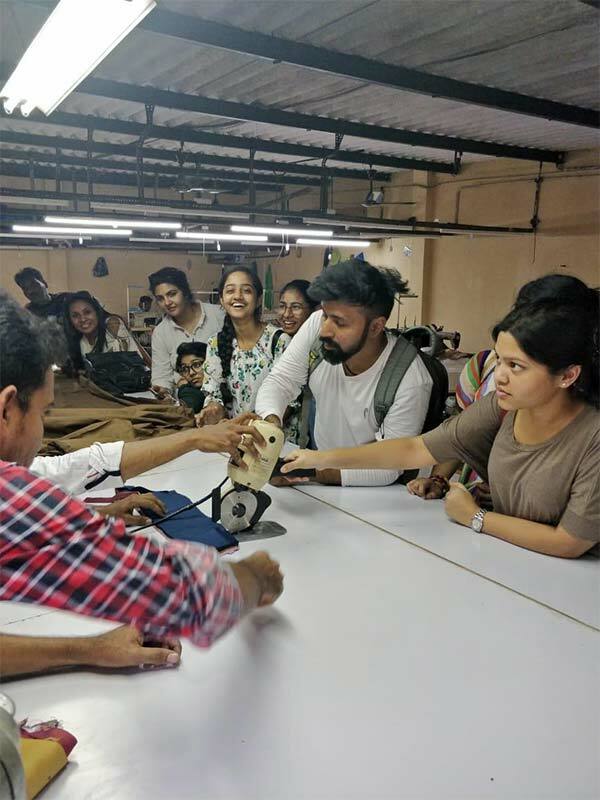 This is just the beginning for the emerging fashion designers. 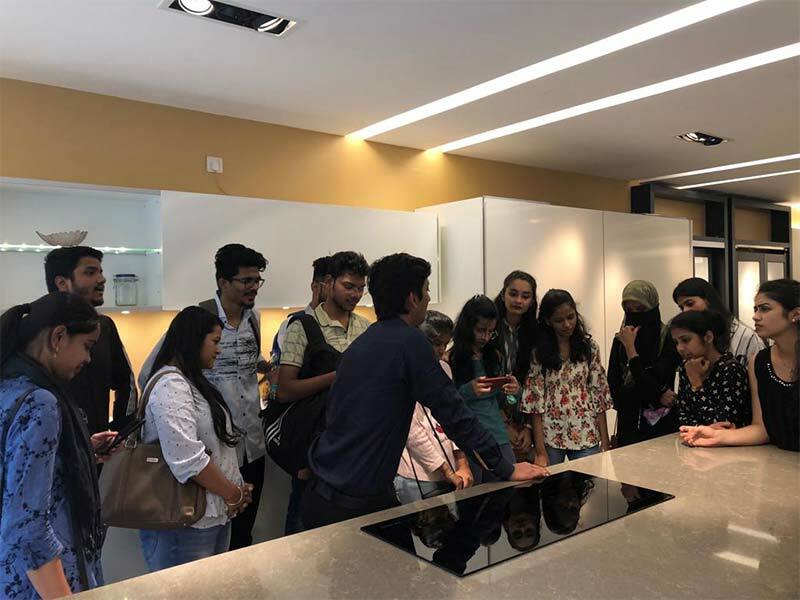 Many more visits planned for the students. 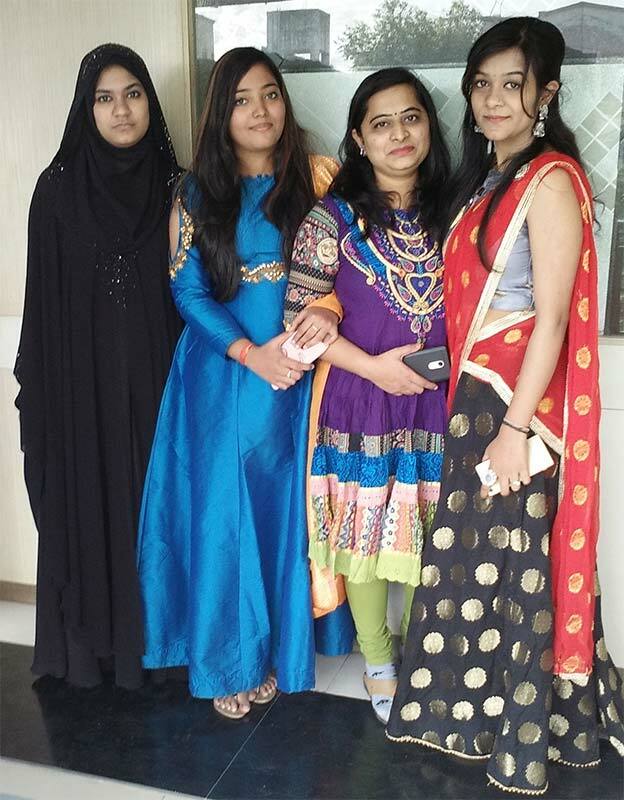 It’s time to share our students success. 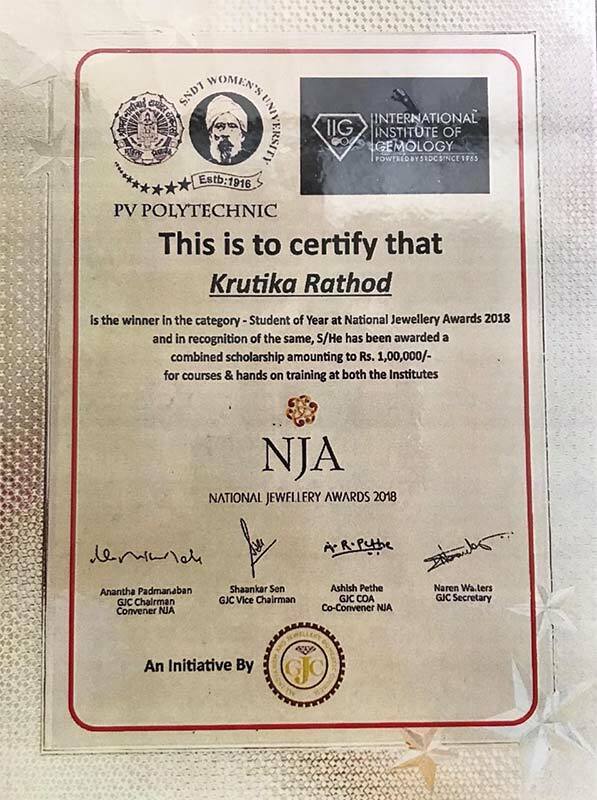 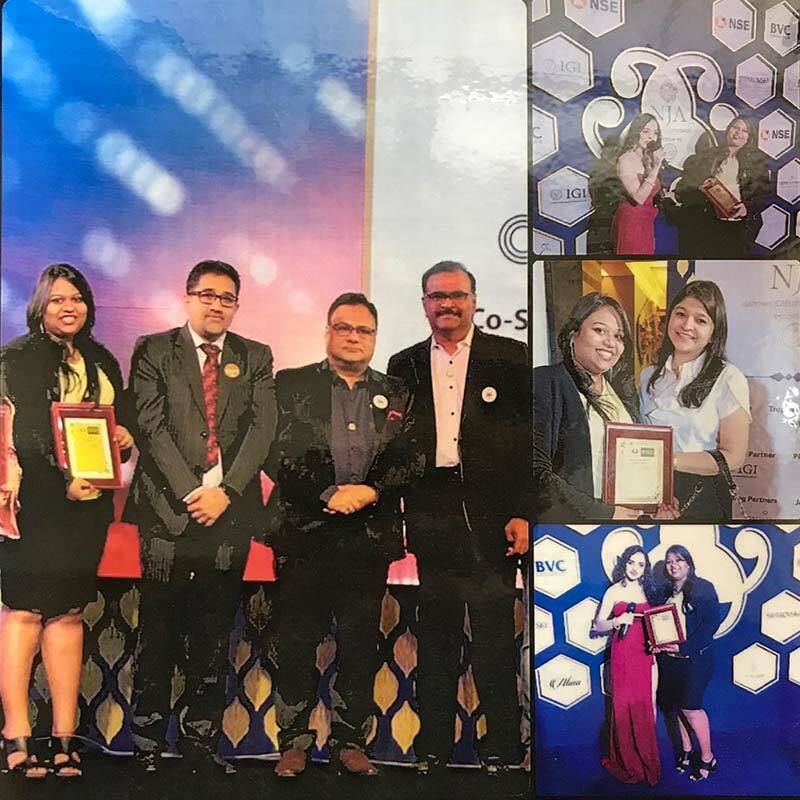 Krutika Rathod student of Jewellery Desigining course at IITC was one of the winners at the National Jewellery Awards 2018. 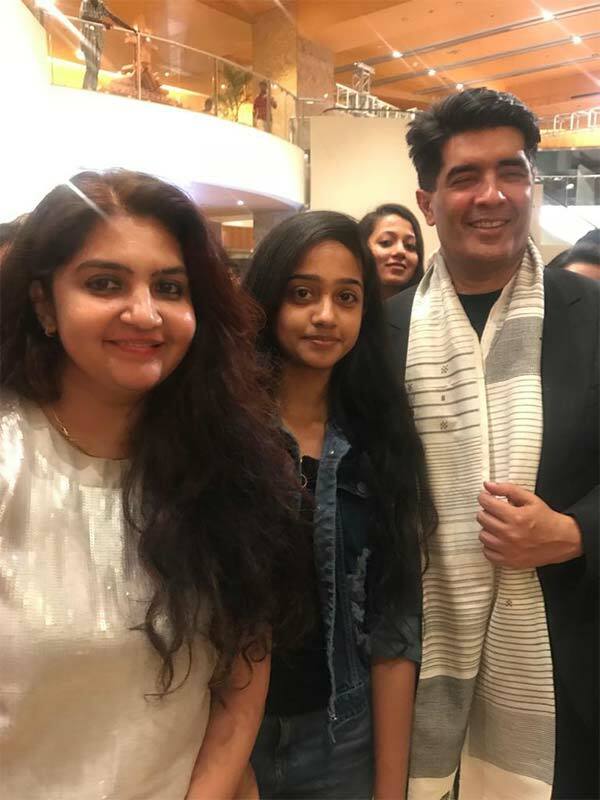 Her designs won her the “Student of the year Award “ at the event. 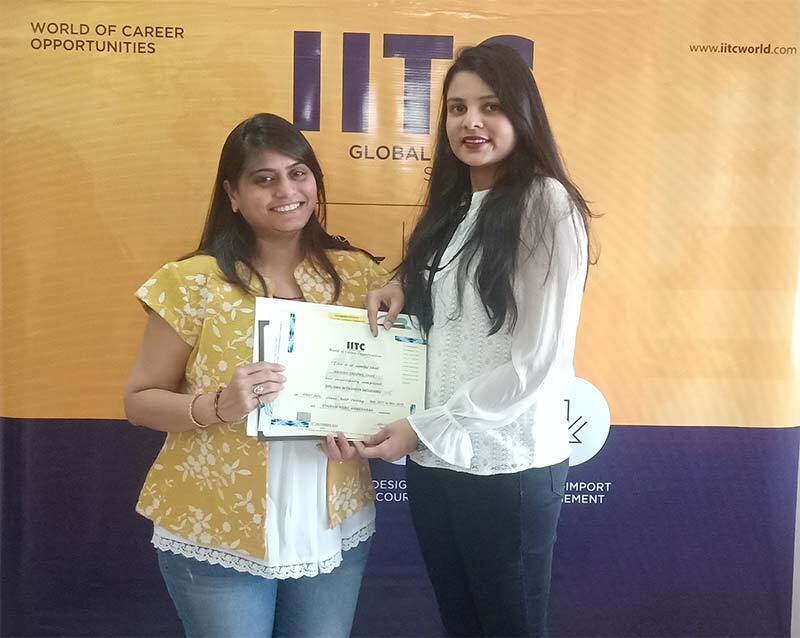 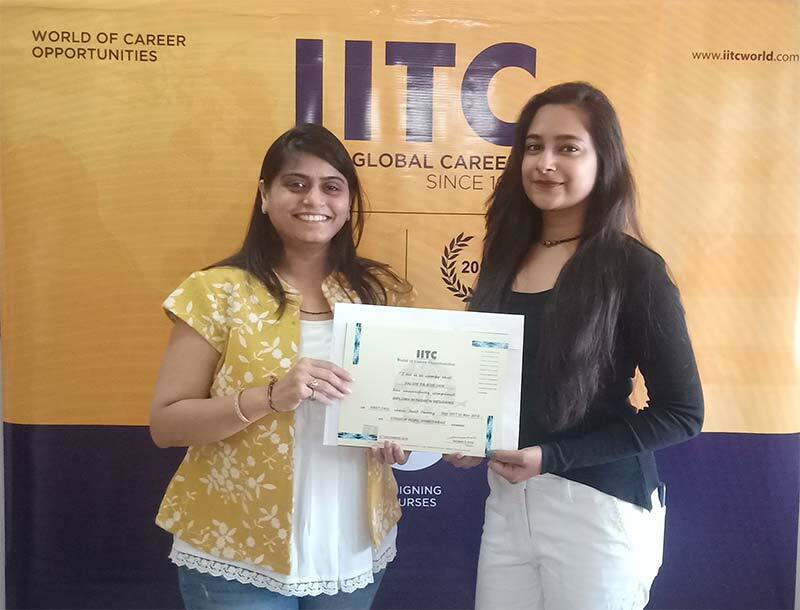 We at IITC congratulate Krutika Rathod for this achievement and wish her All the best in her career. 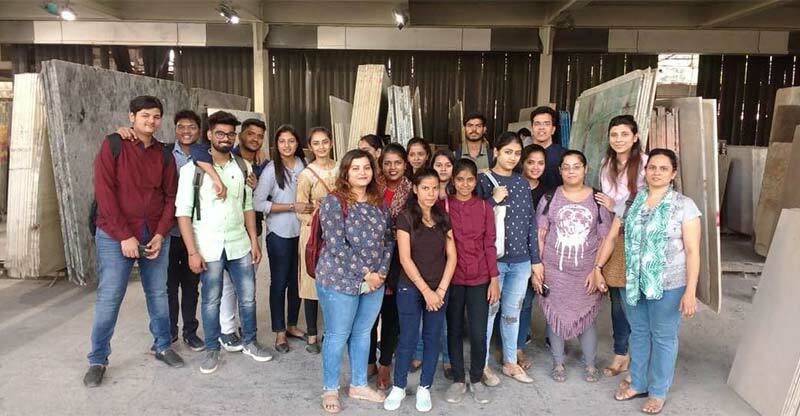 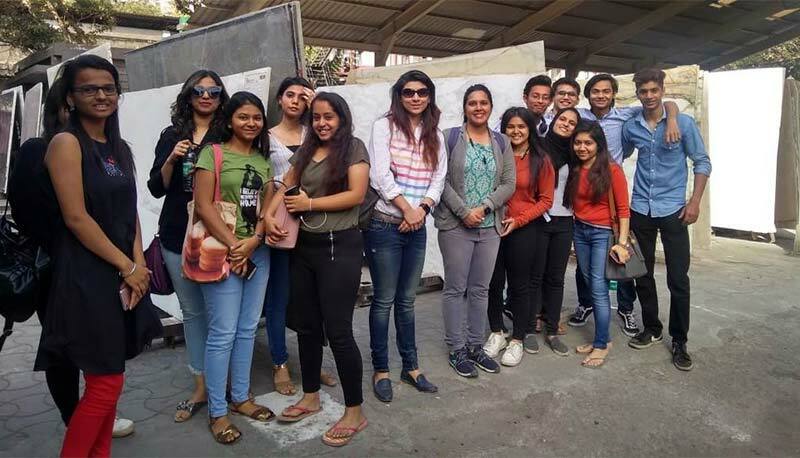 IITC had arranged an INDUSTRIAL VISIT to Furniture Manufacturing Units in Bhiwandi for their Interior Designing Students of IITC Mumbai as a part of the course curriculum. 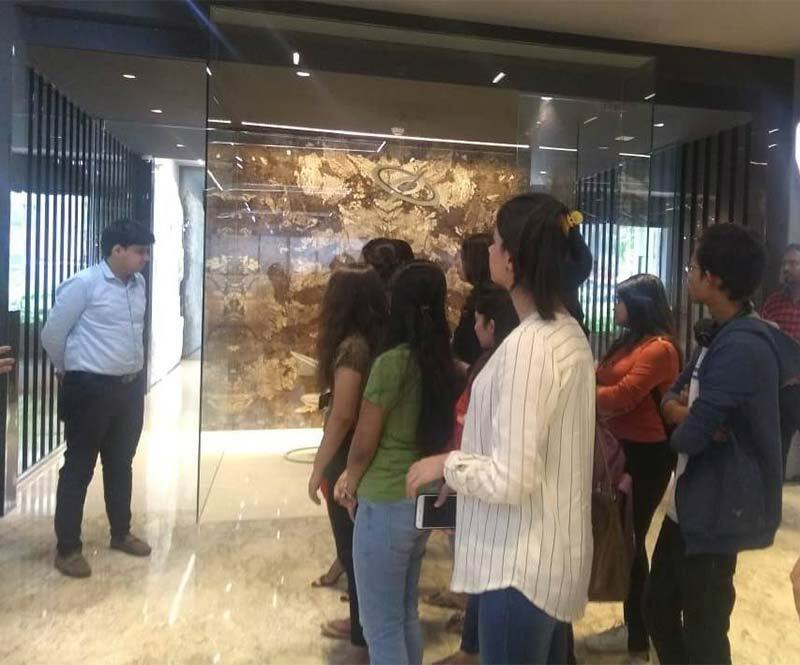 Students visited Arihant Mattress, one of the largest mattress & furniture manufacturers in India. 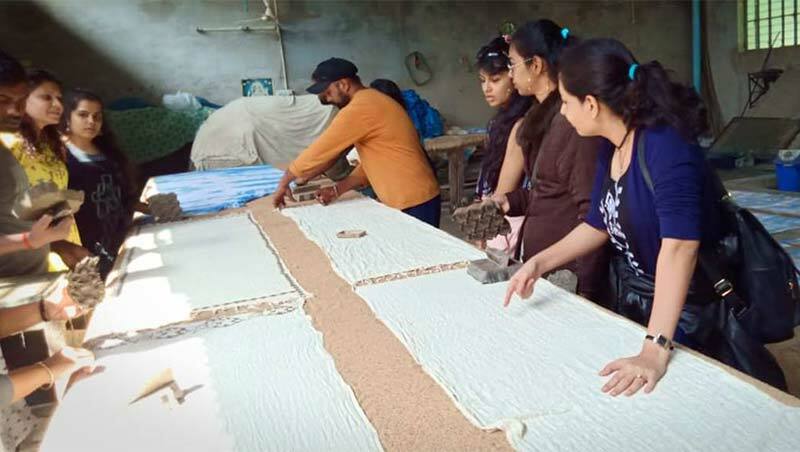 For the past 10+ years, they have been making their expertise in engineering and manufacturing high-quality & high-end mattress for star hotels, hospitals and even the Indian Navy mattresses with natural materials, and innovative technology to ensure better sleep. 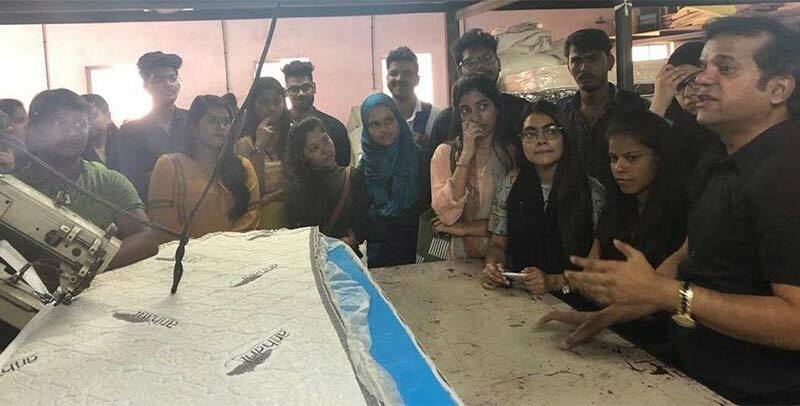 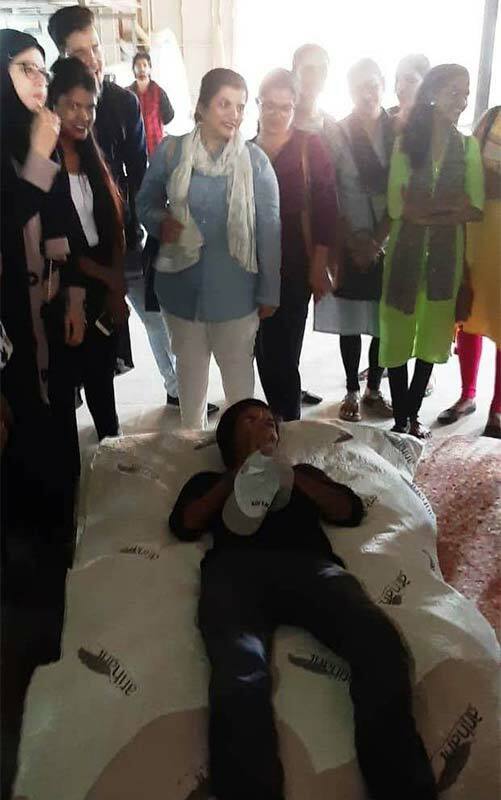 This was one of its kind units where students got the opportunity to see & learn in detail the steps involved in manufacturing scientifically designed & ergonomically developed Mattresses for body soothing, back care for people suffering from problems like spondylitis, arthritis, back-aches, and a billion other health hazards. 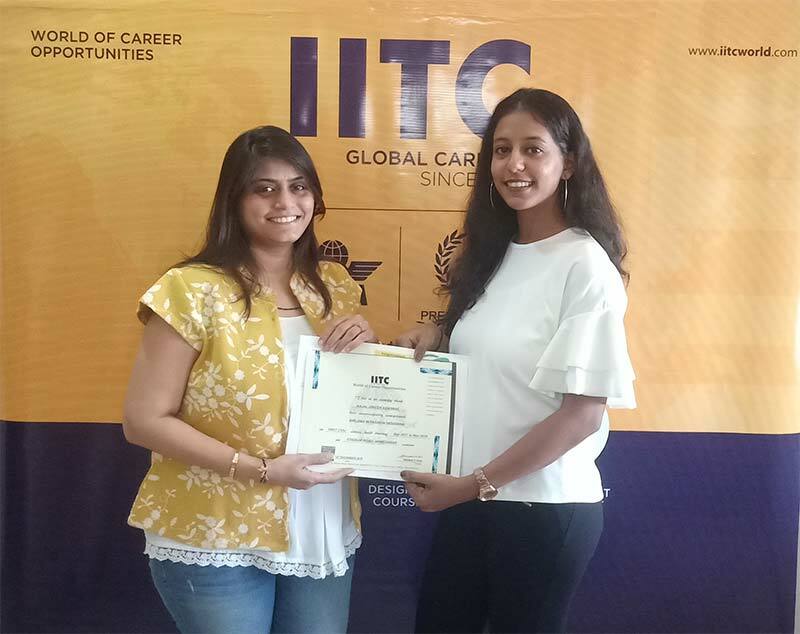 IITC Interior Designers learned the need to suggest the right type of mattresses to their clients during their career in Interiors, that helps body revitalize & rejuvenate in the most comfortable way while sleeping for eternal health & relaxation. 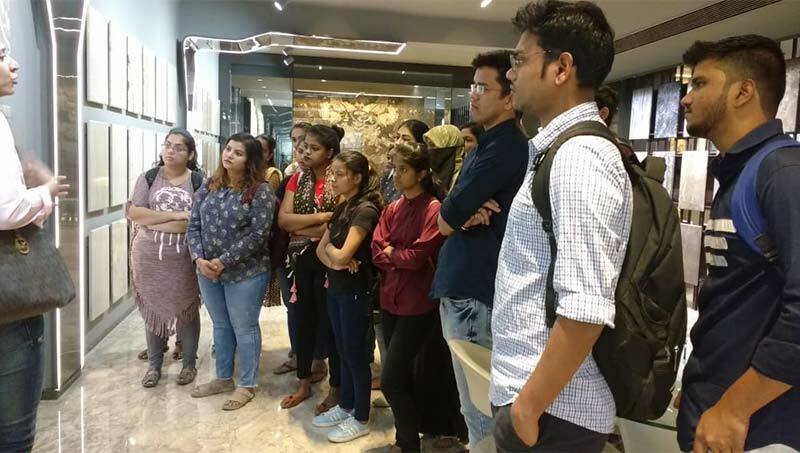 It was indeed a very informative & useful visit for all. 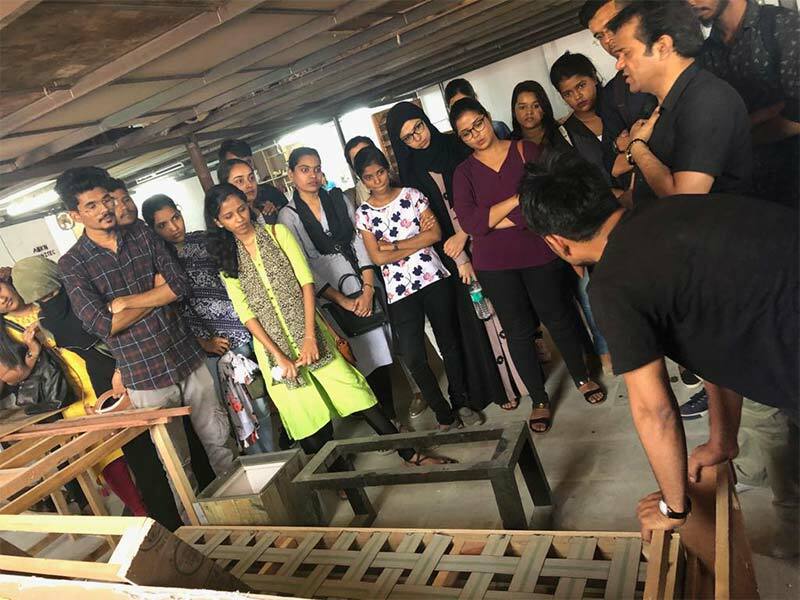 As a part of the Interior Designing course curriculum the IITC students are given exposure to understand the use of different materials used in the field of construction. 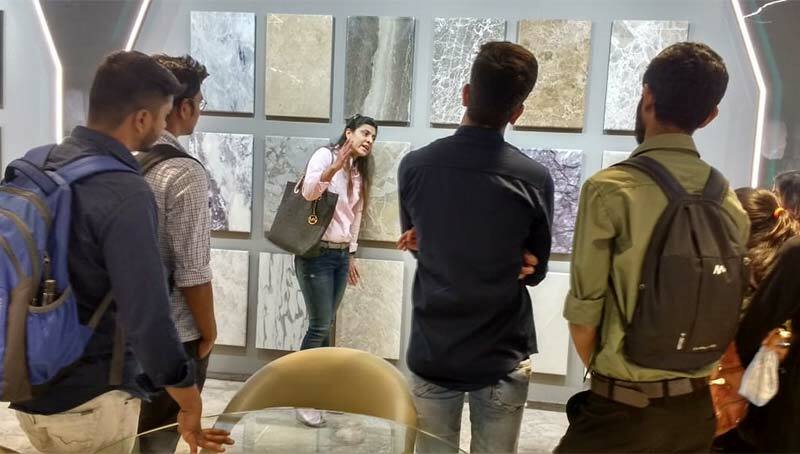 The main purpose is to attain market knowledge and how to facilitate it into their works. 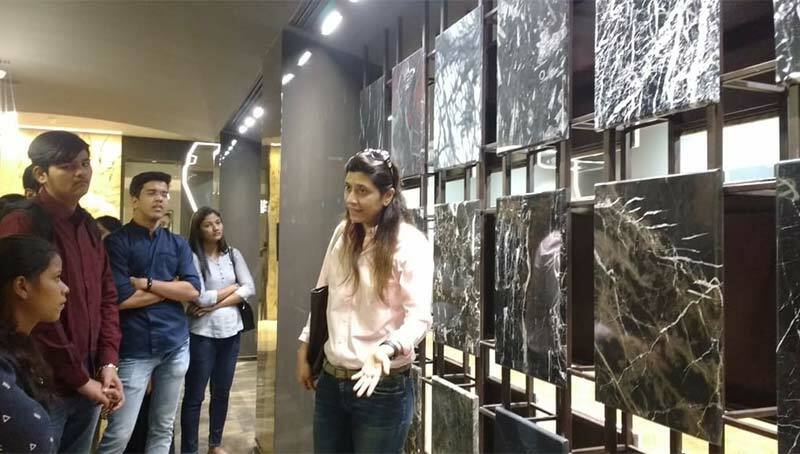 One such visit was conducted at CLASSIC MARBLE COMPANY one of the largest importers of stones in India. 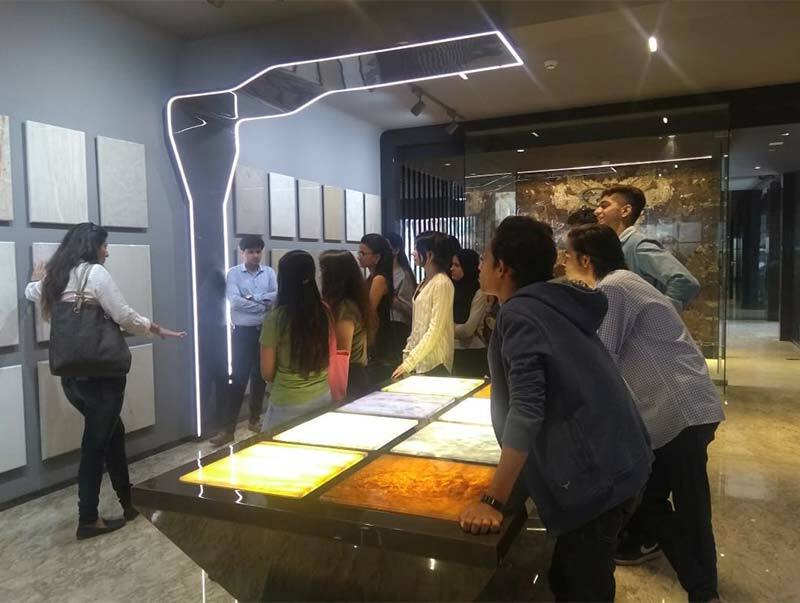 Here the students were exposed to a variety of Italian marbles, semi precious stones such as Onyx , types of granites, composite stones, tiles and the variety of treatments done on the same. 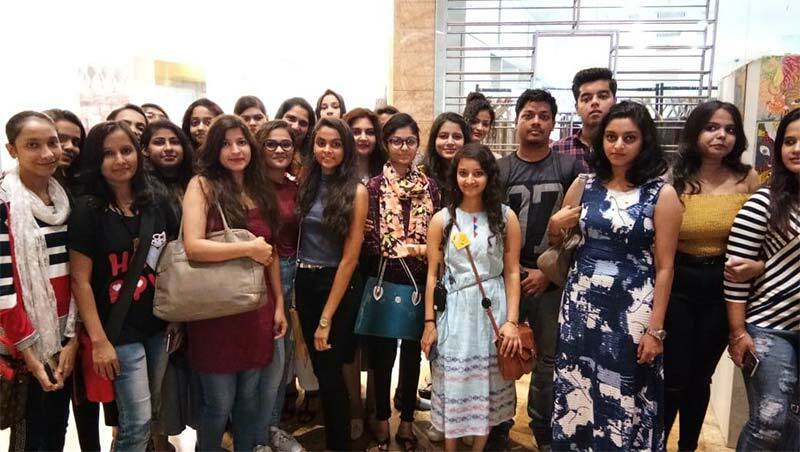 Study tour for Fashion Designing Students of IITC to Jaipur. 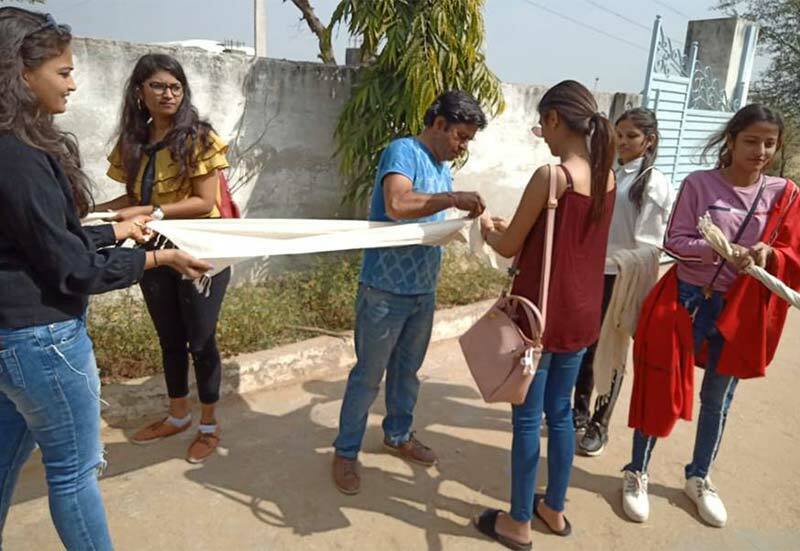 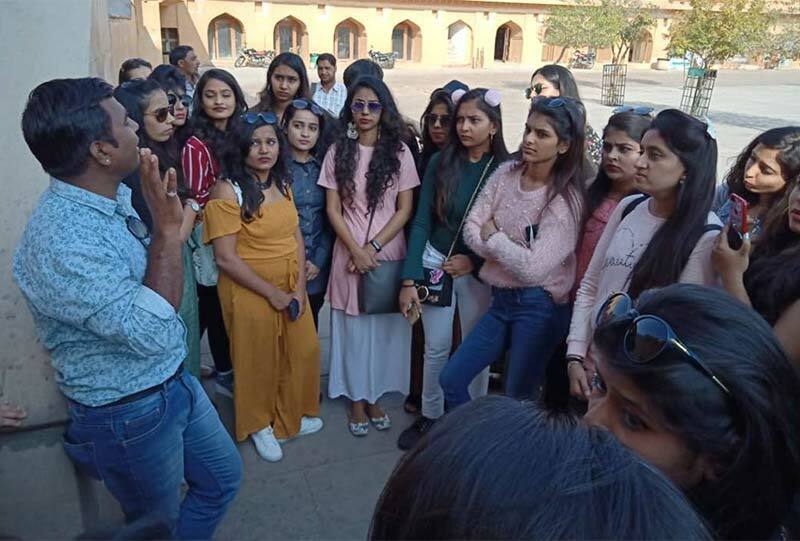 Study tour for Fashion Designing students of IITC to Jaipur on 6th and 7th Feb 2019. 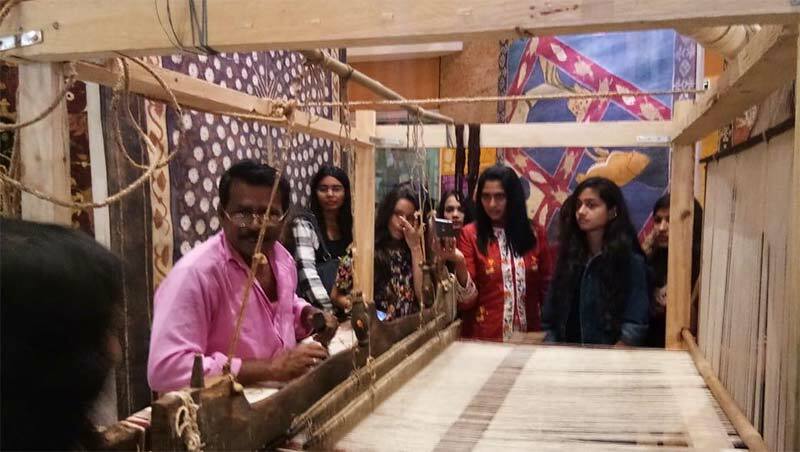 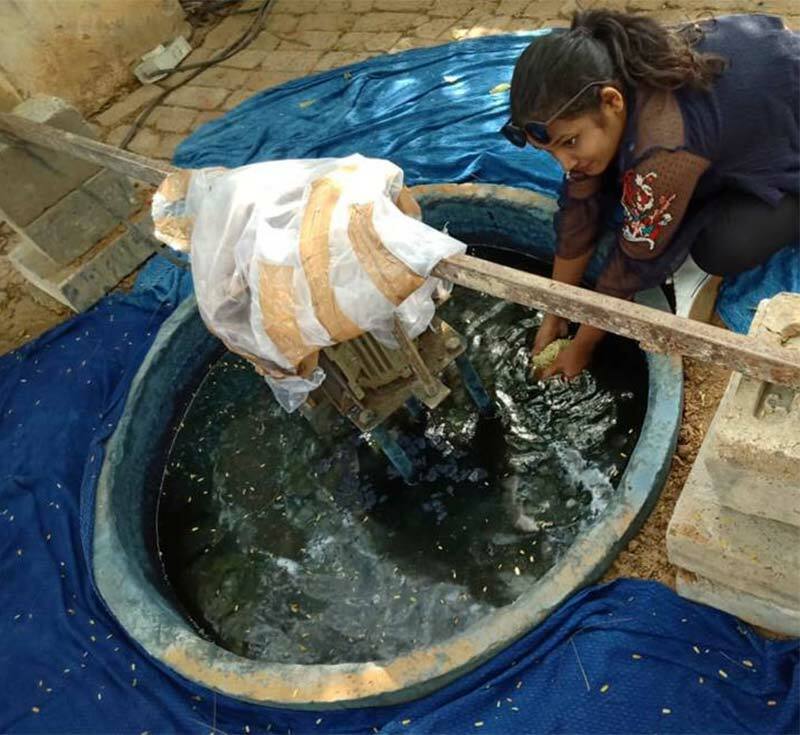 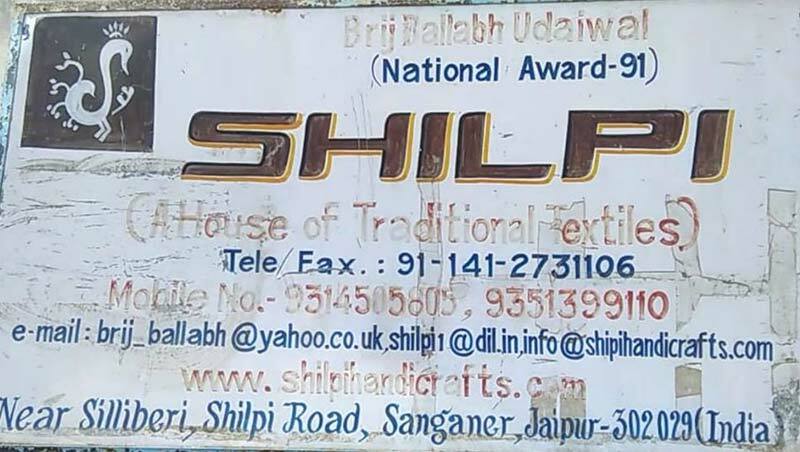 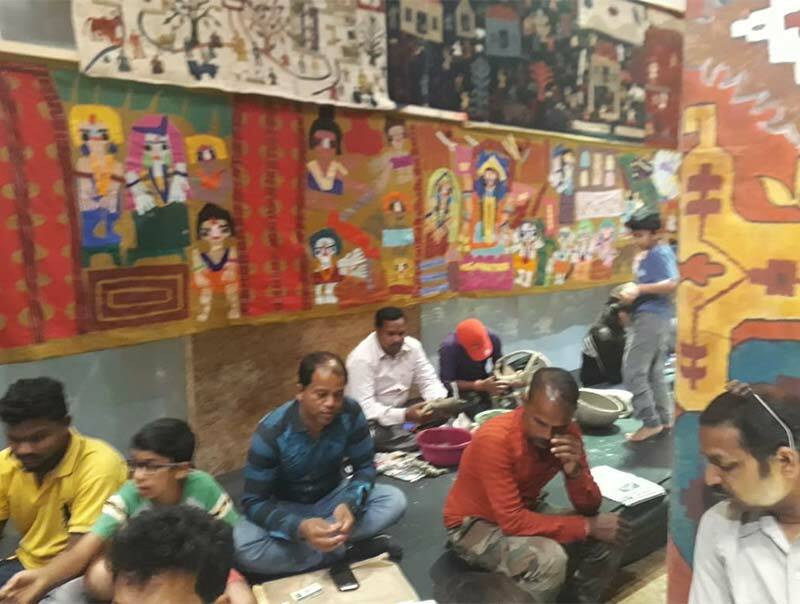 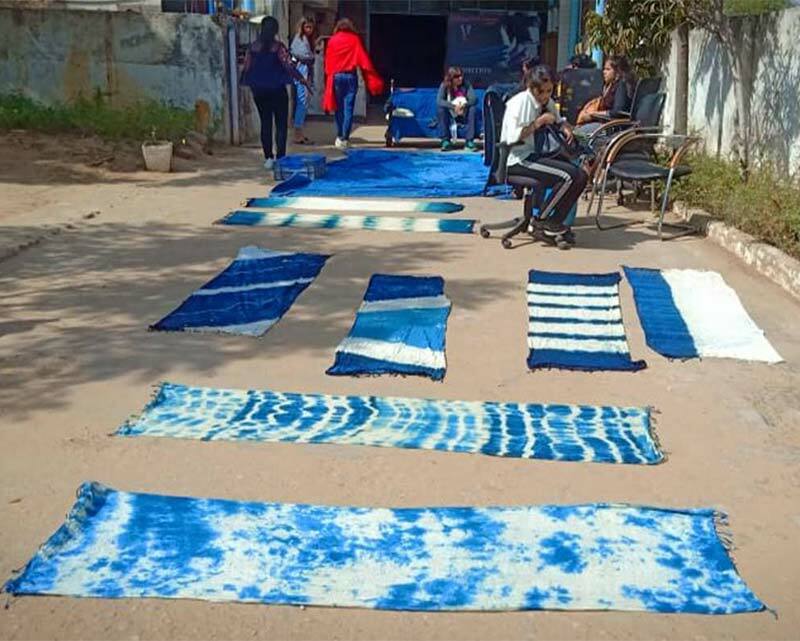 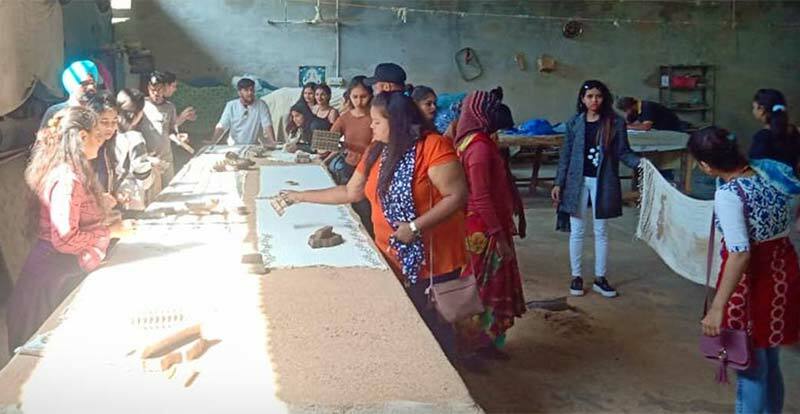 They visited "Heritage Textiles and Handicrafts" at Jaipur and "Shilpi" at Sanganer to study about Natural and Synthetic Indigo Dyes, Block Printing, Washing Units, Sujani Embroideries, etc. 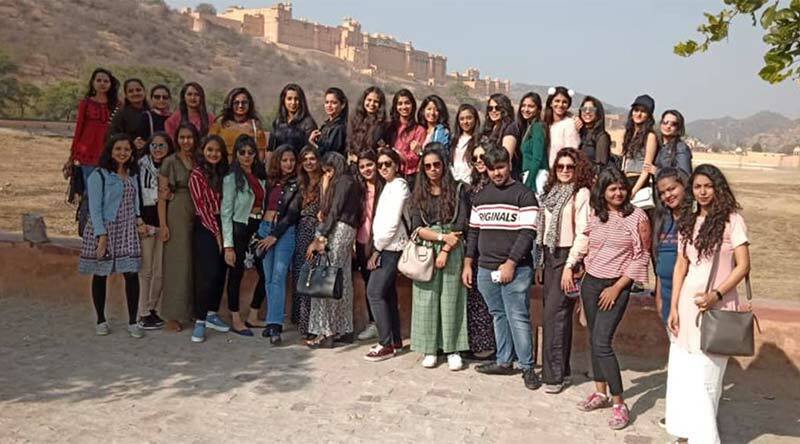 They also visited the famous Amer Fort and the popular markets at Bapu Bazaar and Johari Bazaar to understand the regional trends. 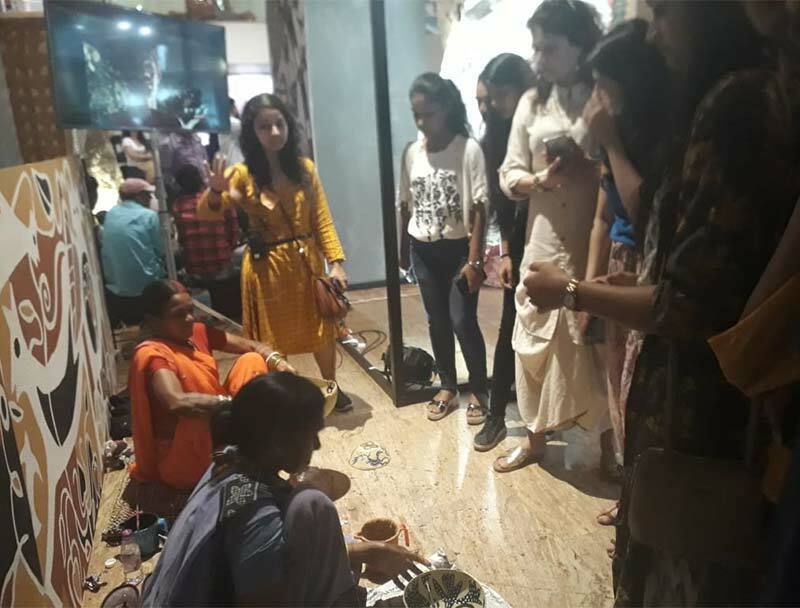 To add flavor to the trip was an outing to "Chokhi Dhani" to experience a perfect Rajasthani experience & its unique culture. 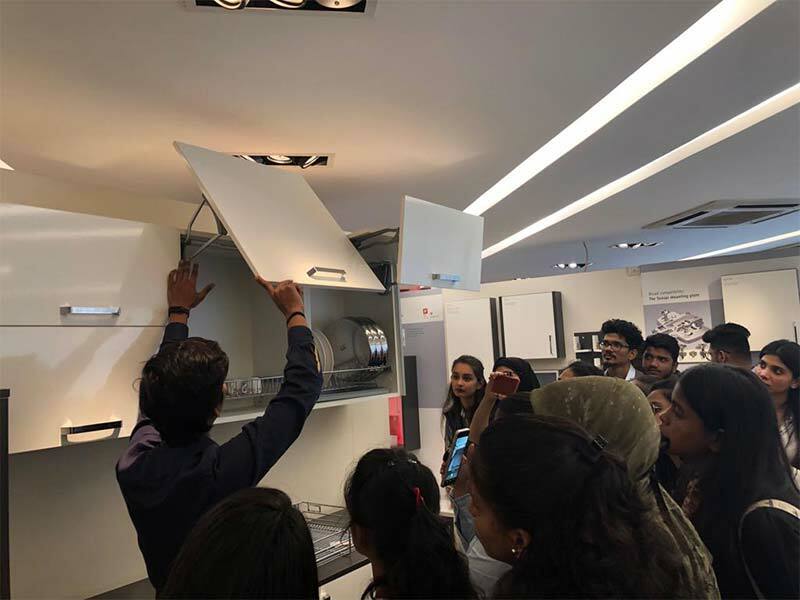 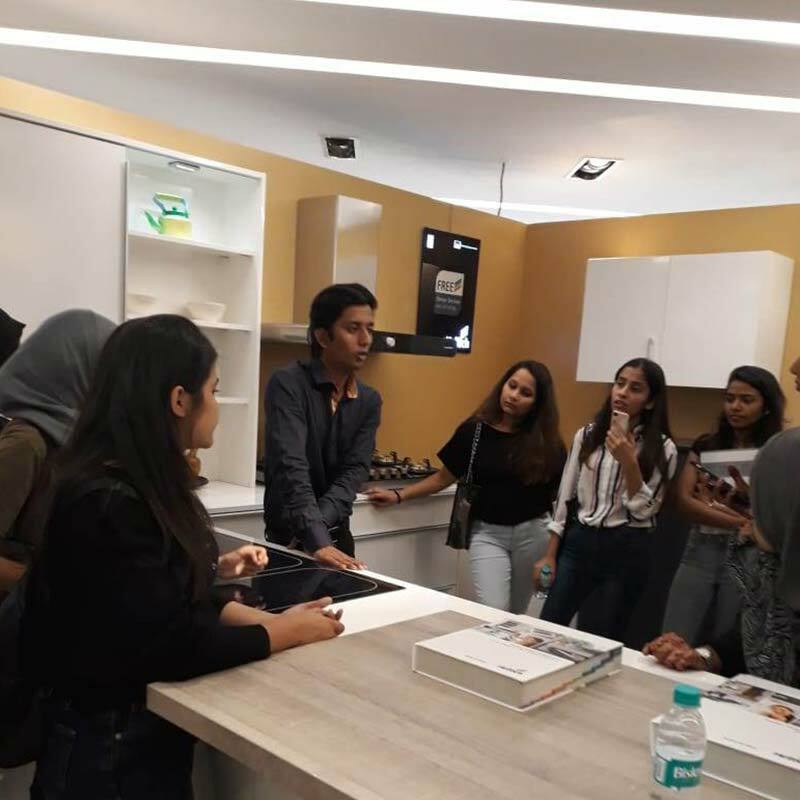 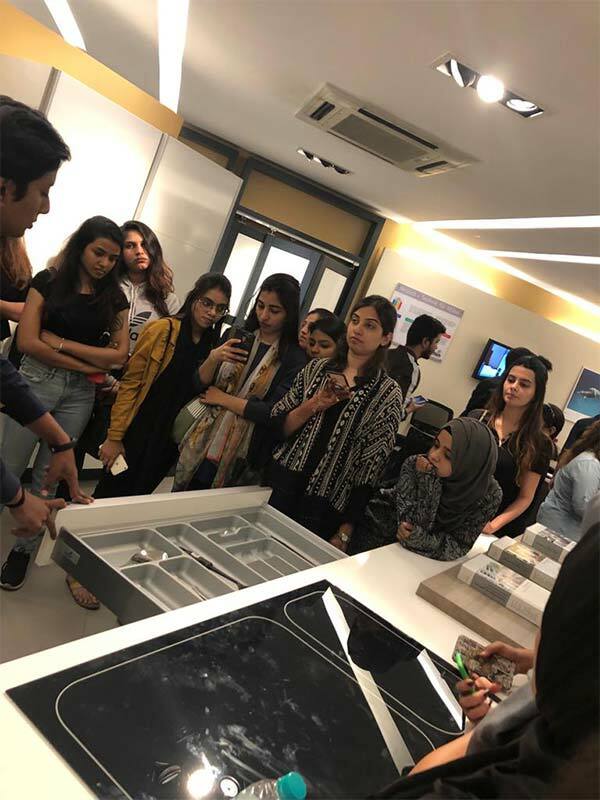 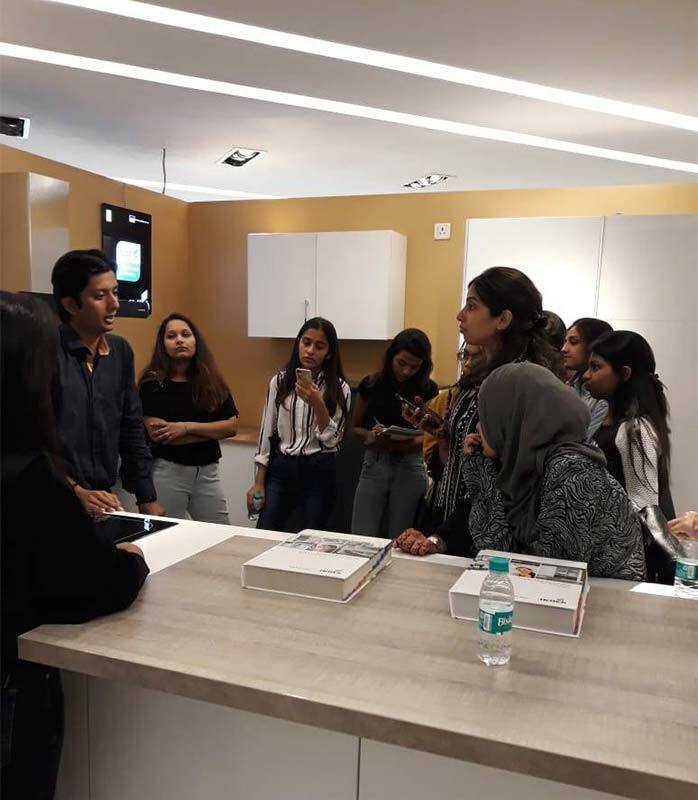 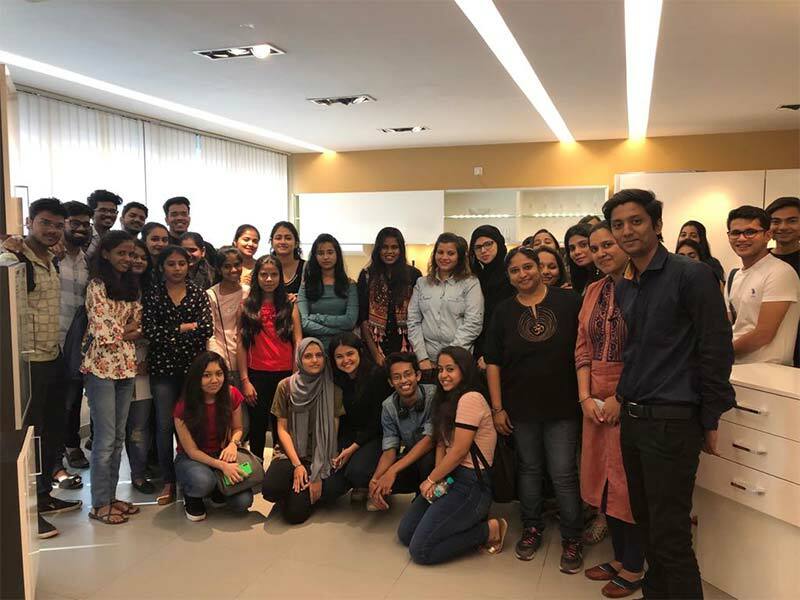 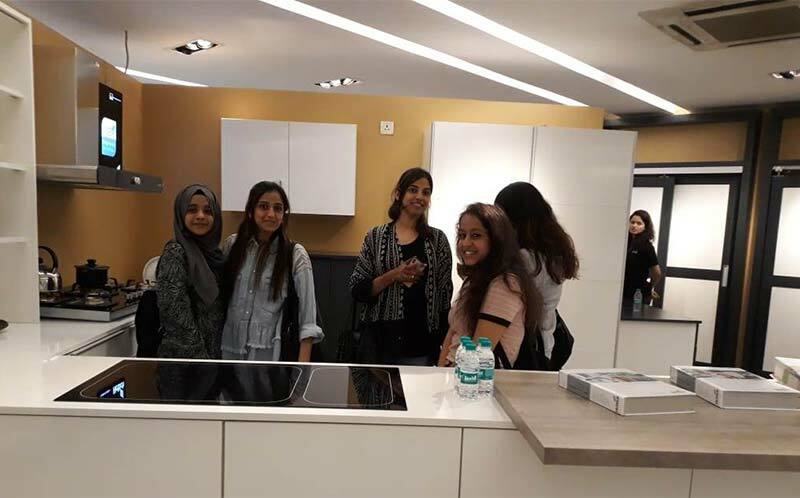 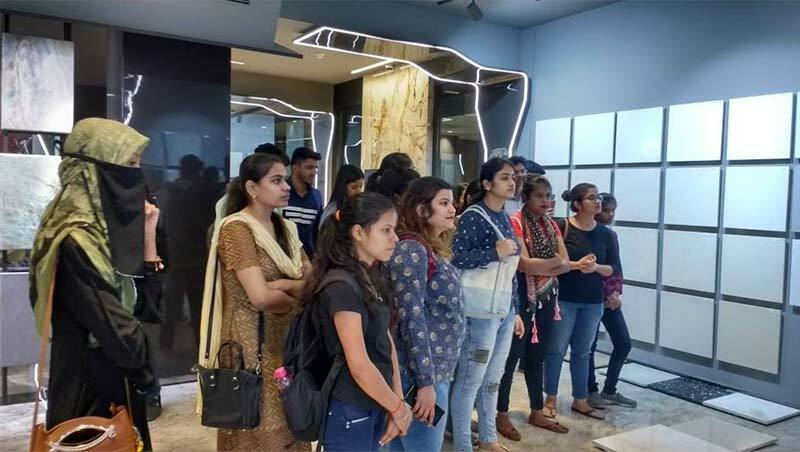 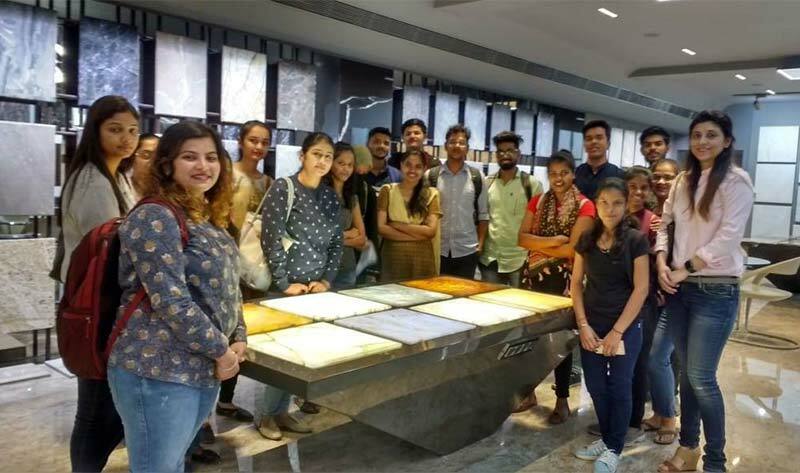 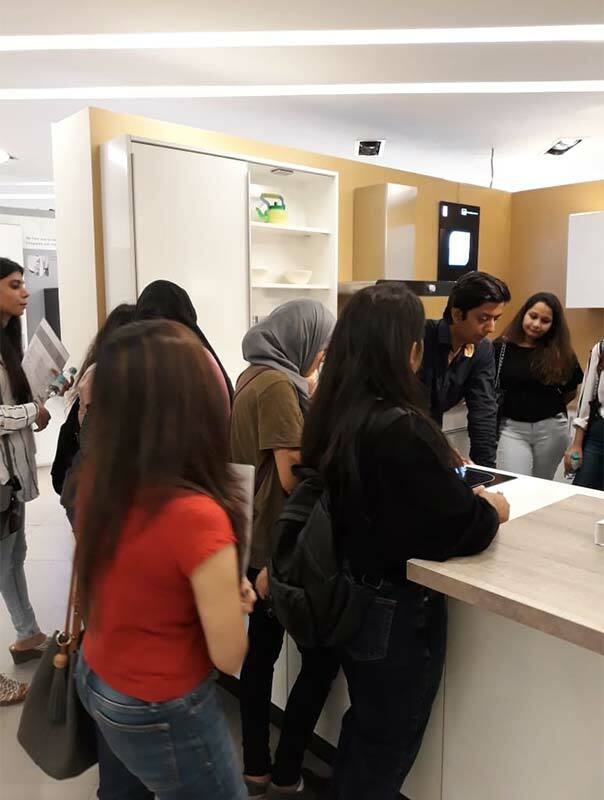 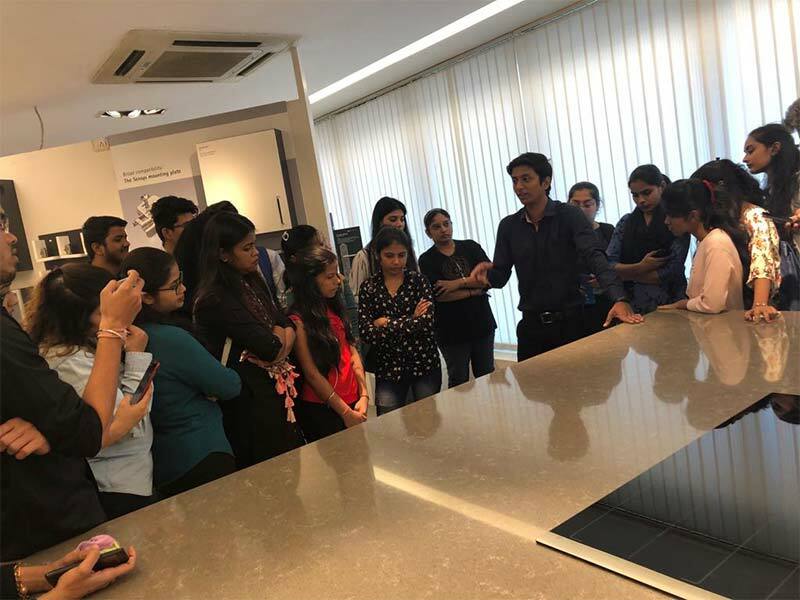 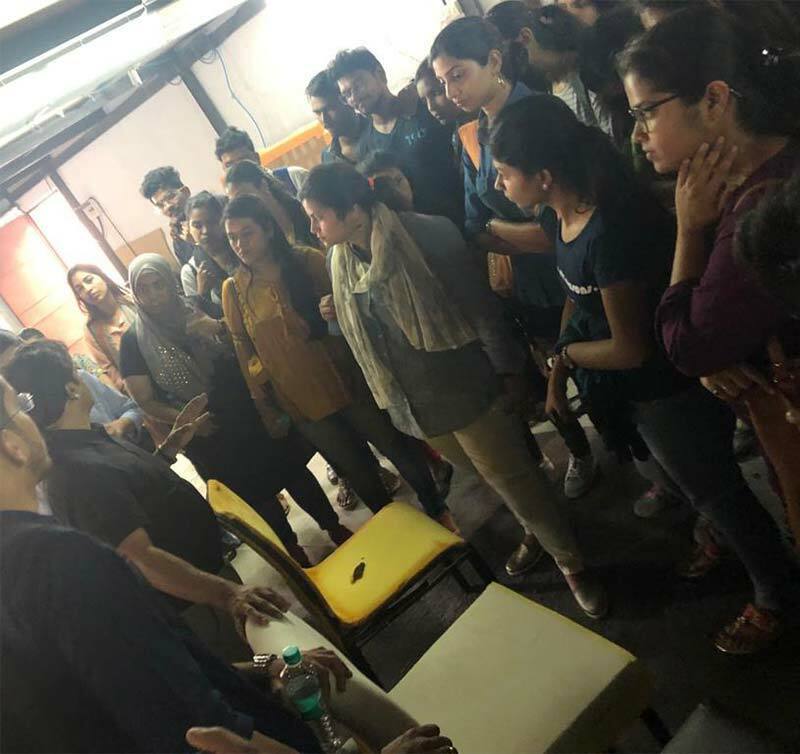 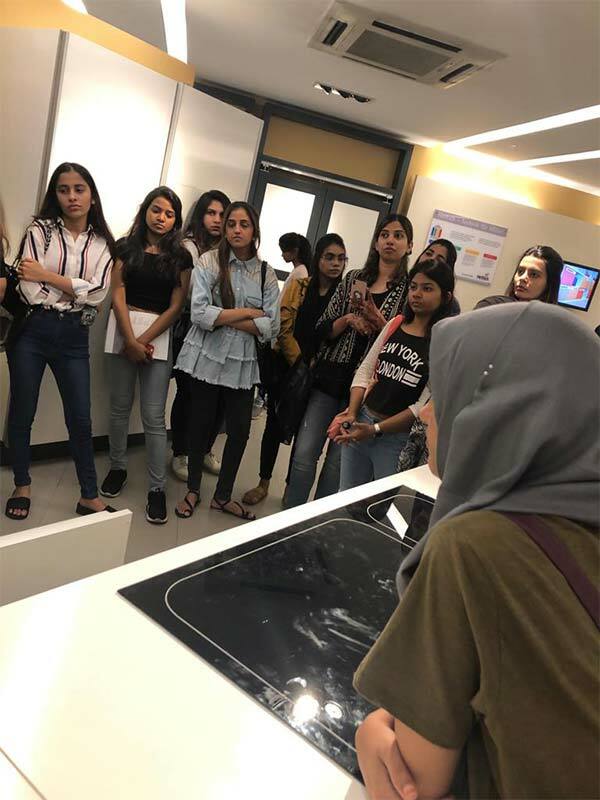 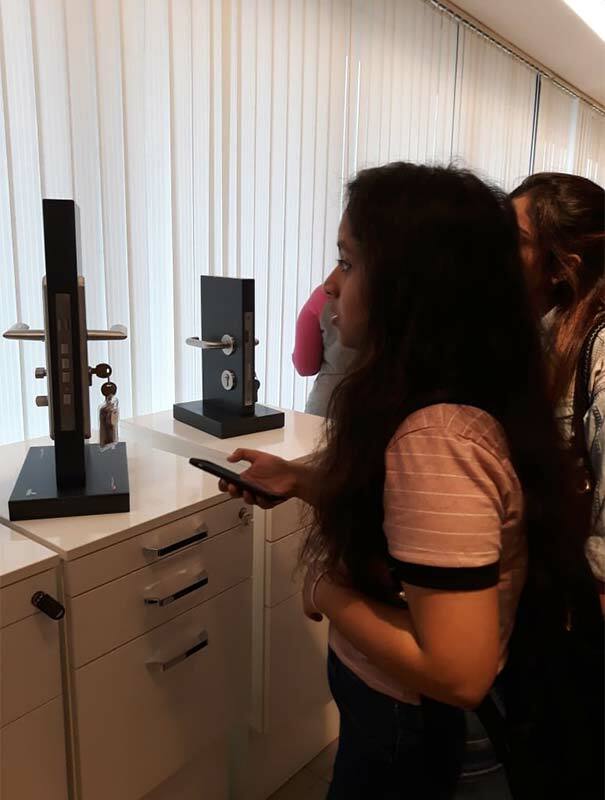 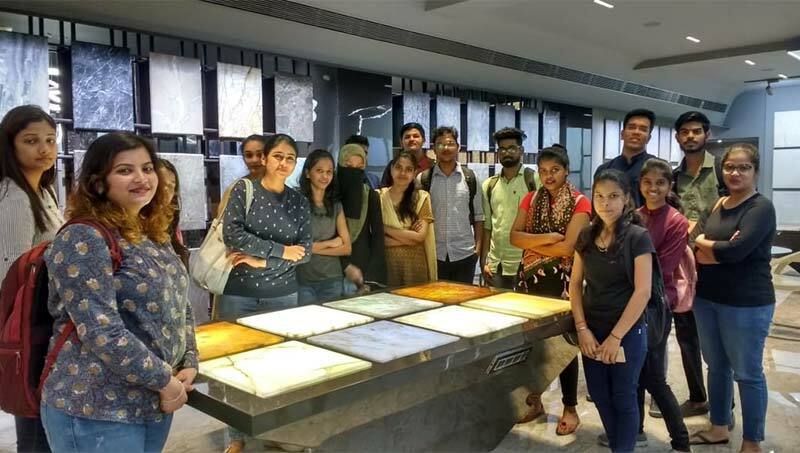 IITC Mumbai had organized an educative "Study Tour" for their Interior Designing students to Hettich - A hardware showroom, one of the world's leading manufacturers of furniture fittings. 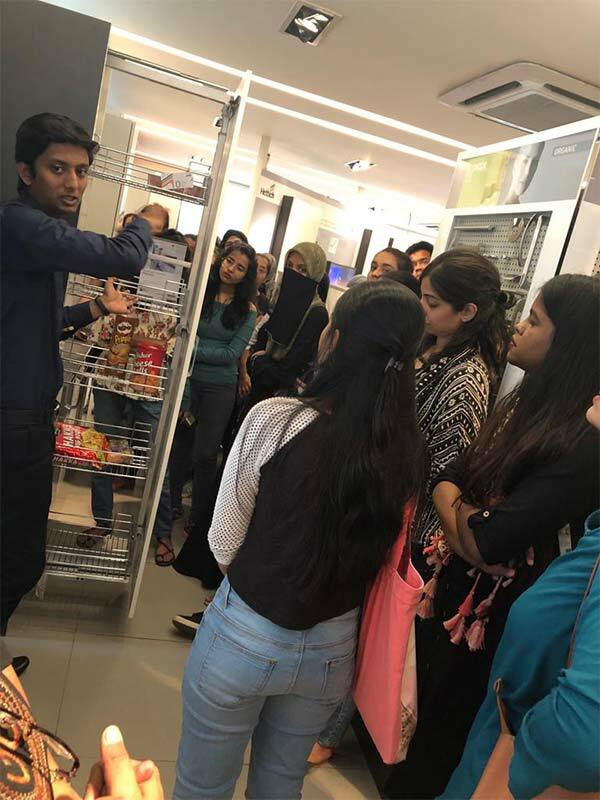 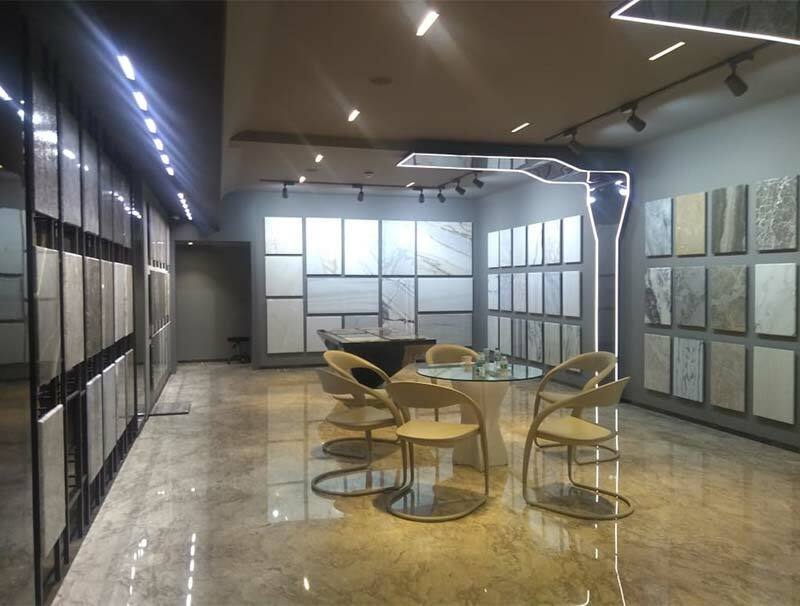 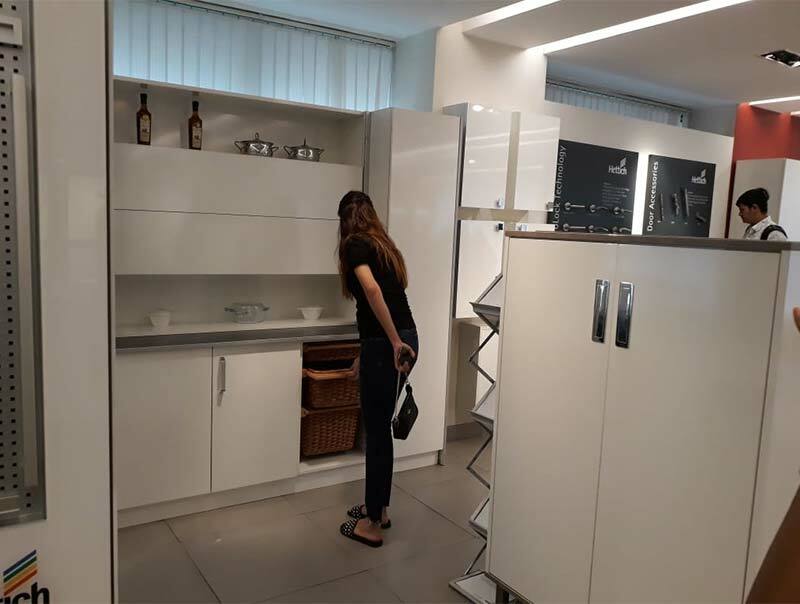 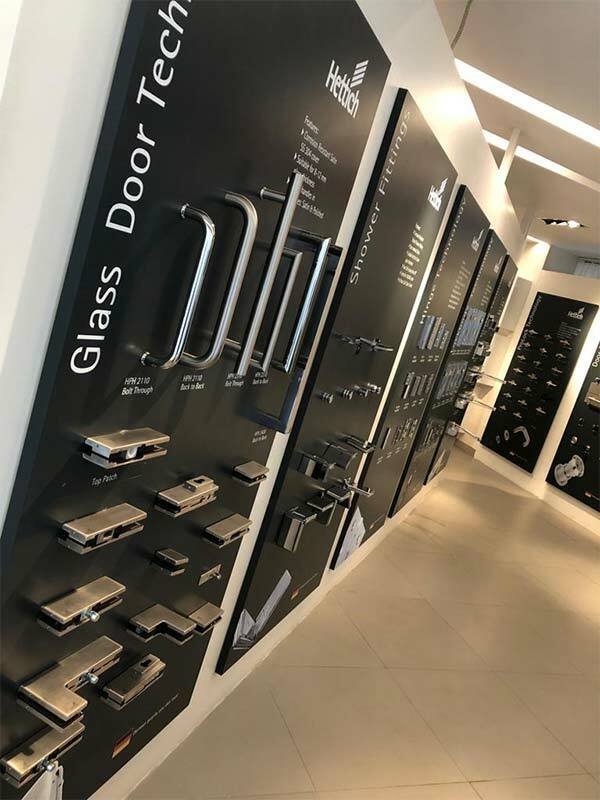 It was a well-guided walk-through tour of various hardware materials used in kitchen cabinets, kitchen corners, drawers, overhead flap fittings, wardrobe fittings, walk in closets, office workstations and much more. 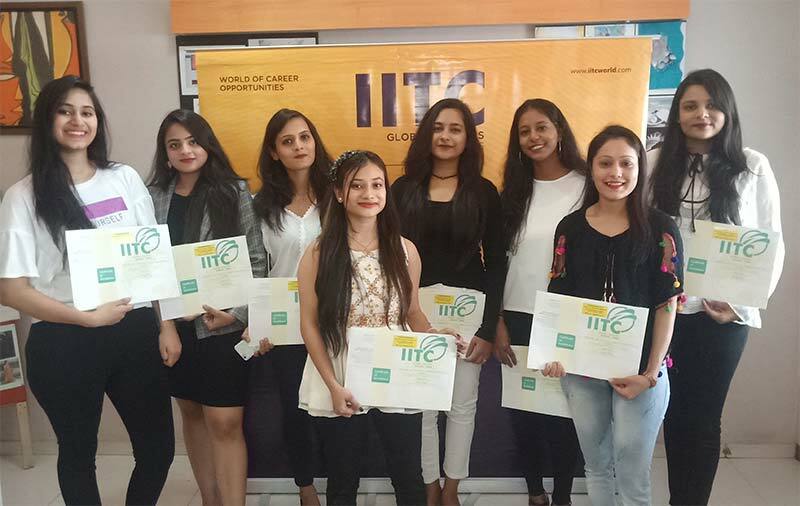 IITC Ahmedabad Students Welcome the NEW YEAR with a bang! 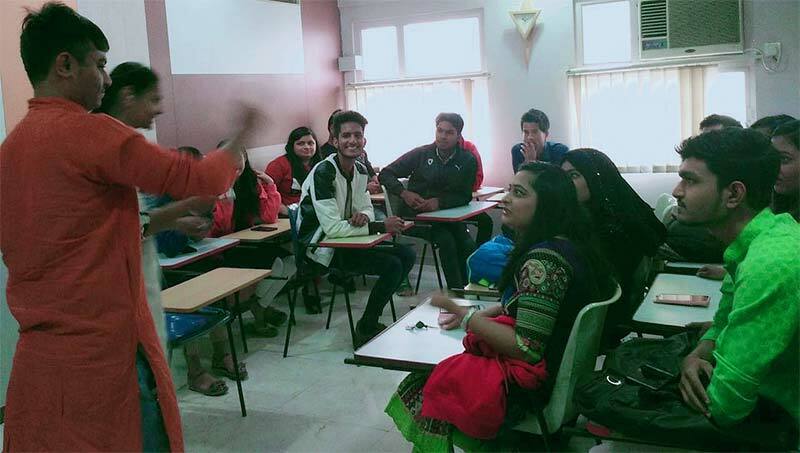 IITC AHMEDABAD took students back in their college day memories and celebrated New Year week with the IITC students. 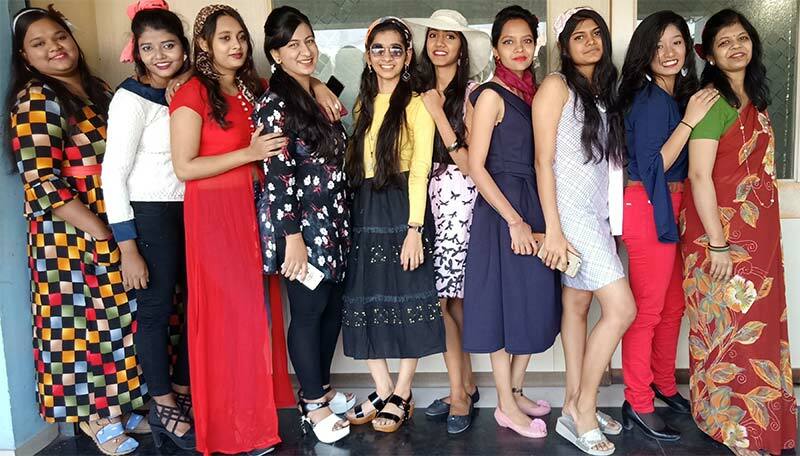 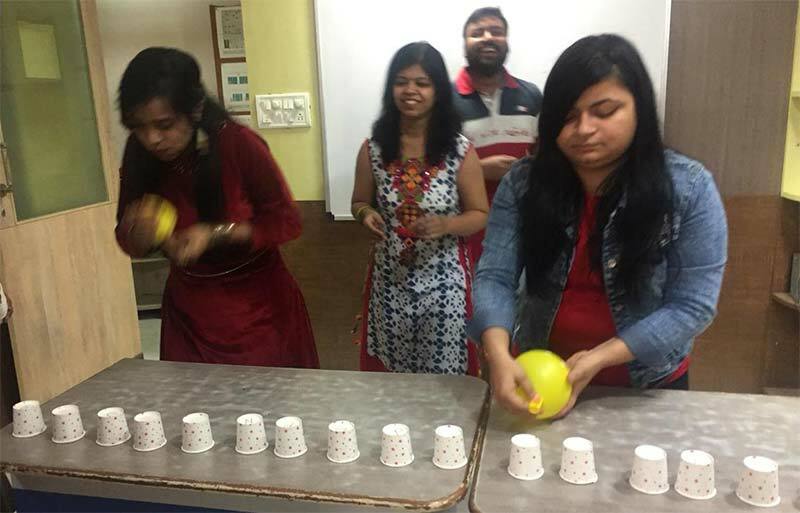 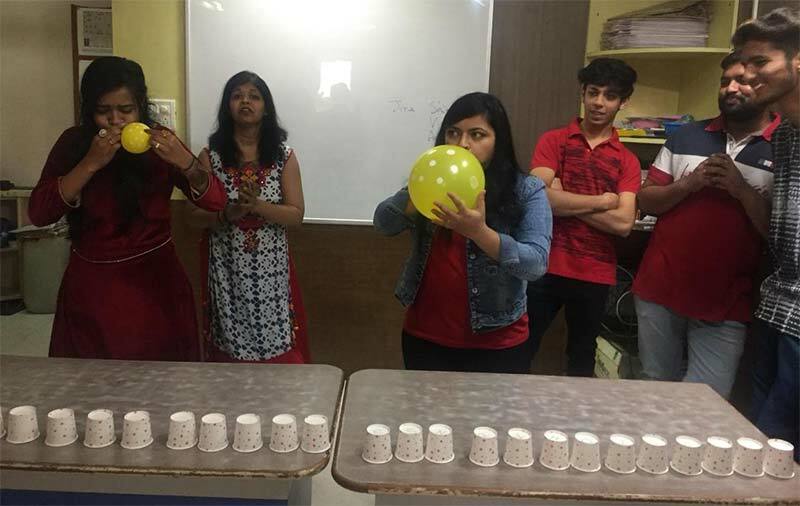 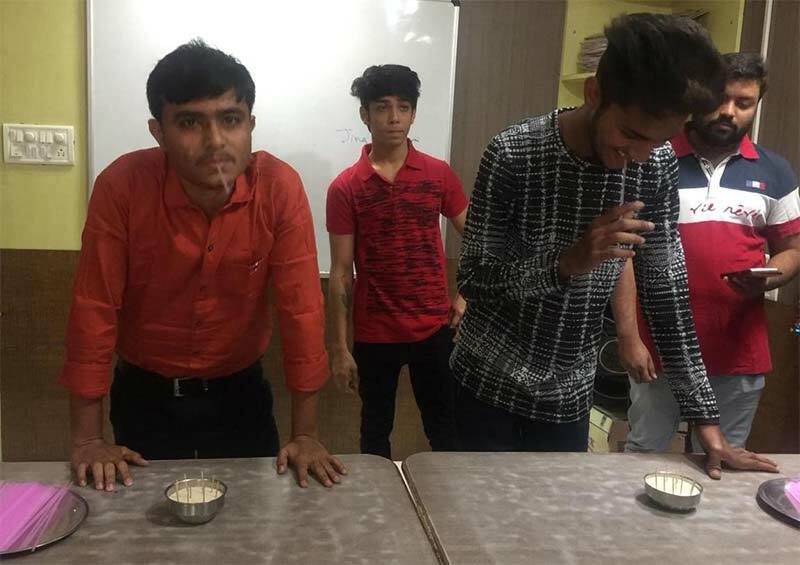 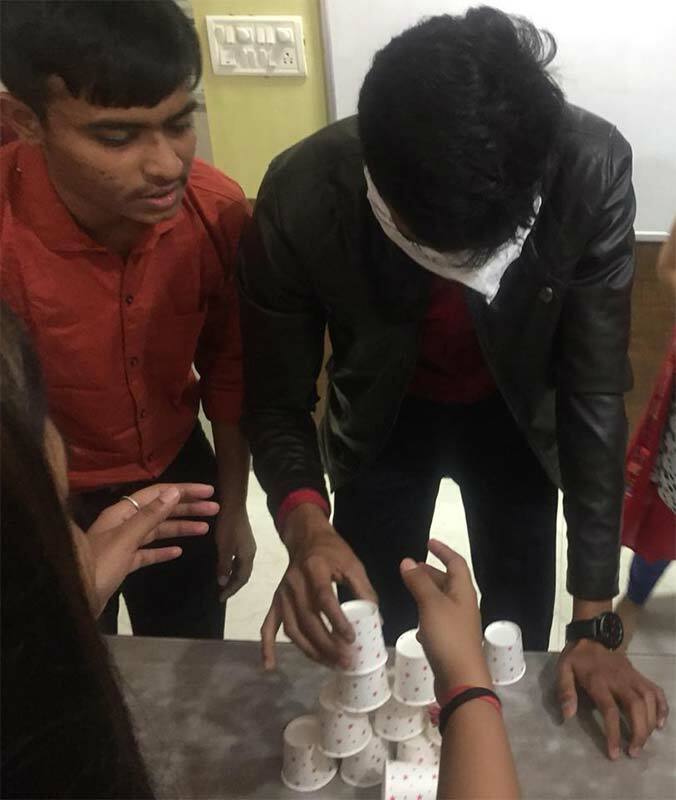 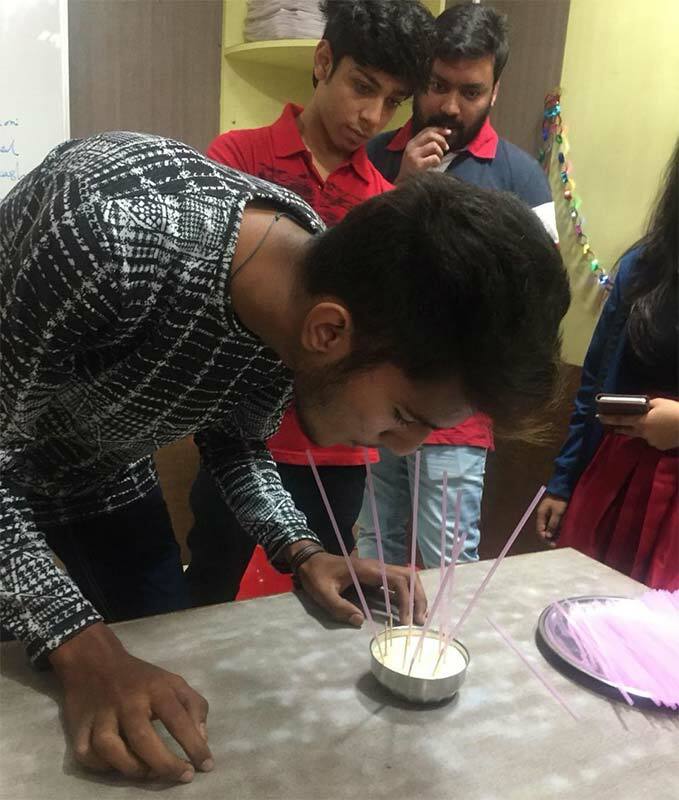 IITC ians from all courses; Fashion designing, Interior designing, Travel & Tourism IATA came together, actively participated & immensely enjoyed celebrating the entire week with Potluck party, Garba dance and Games like, Passing the parcel, inserting straws, blow the cup, get-set-go, Dumb Charades, etc. 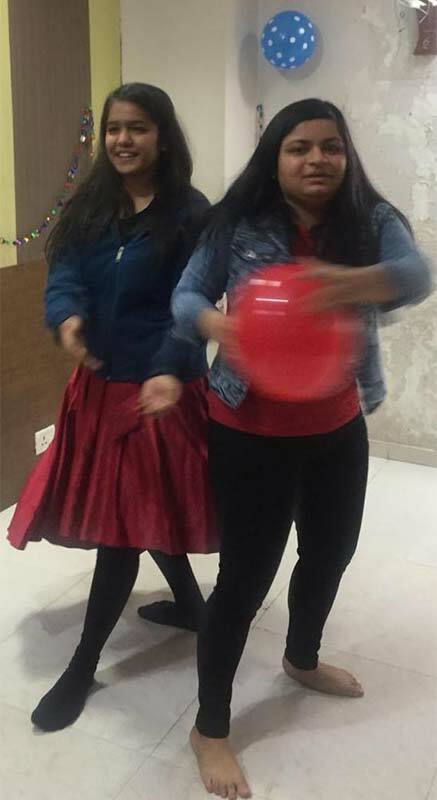 And now we welcome the new year...Full of things that have never been ! 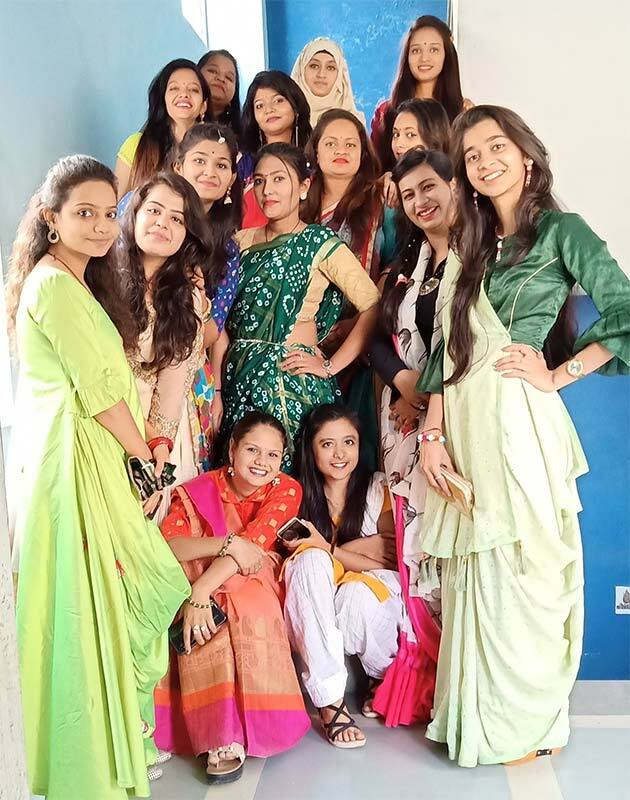 Convocation Ceremony of FASHION DESIGNING students at IITC Ahmedabad. 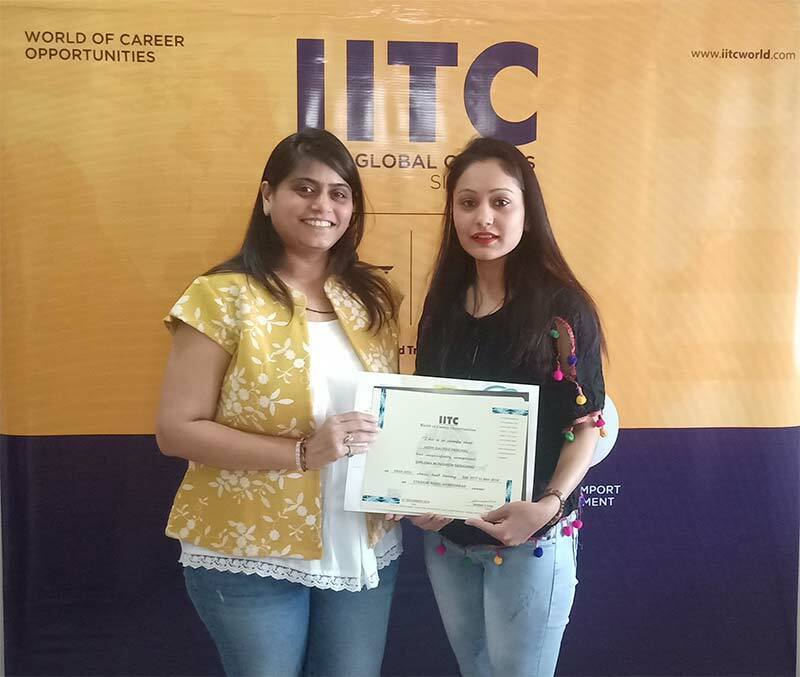 Students being felicitated by Faculty Ms. Ishani Patel & Mr. Mehul Darji. 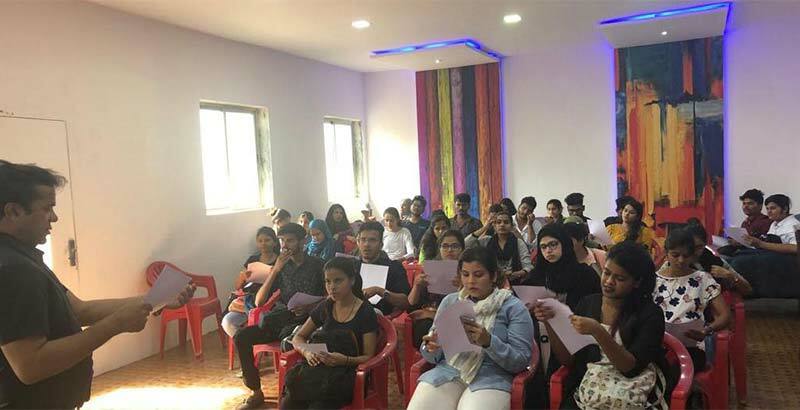 Eligibility Student should have Passed SSC (X) examination from a recognized Board.